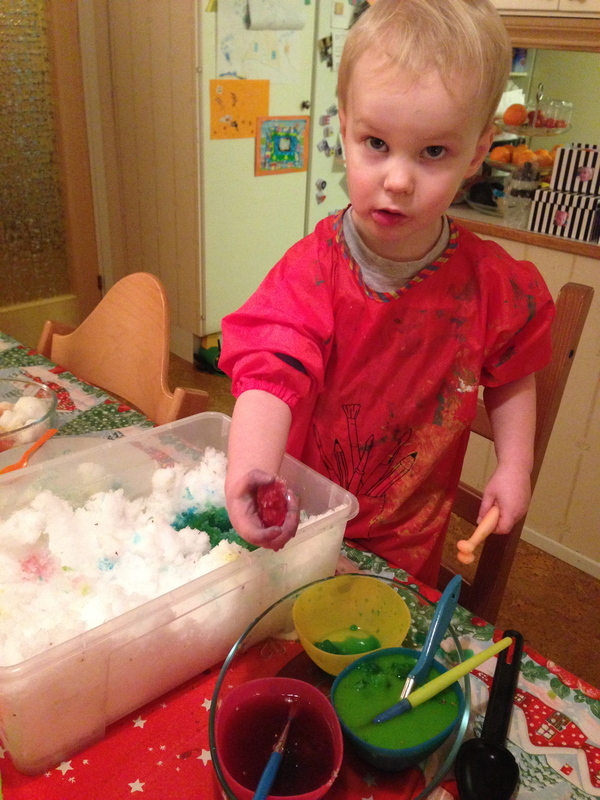 The idea of ‘painting the snow’ quickly went out the window.. 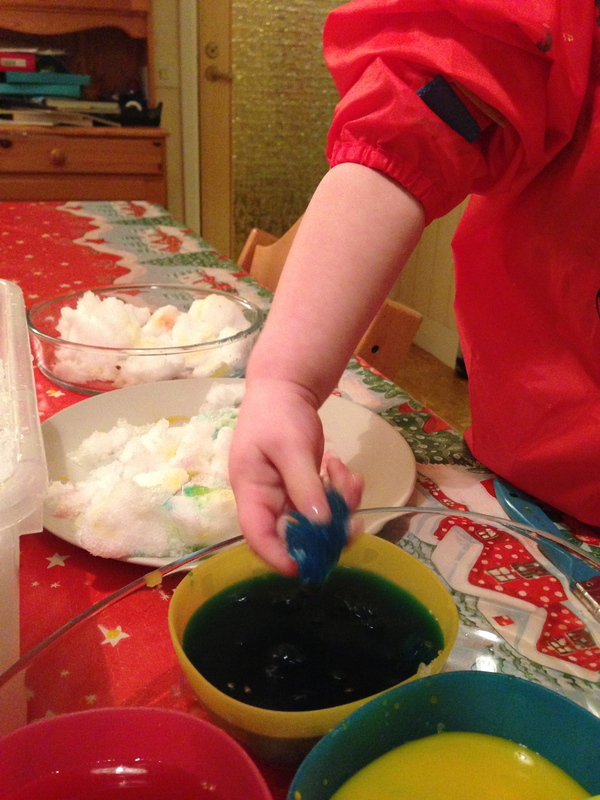 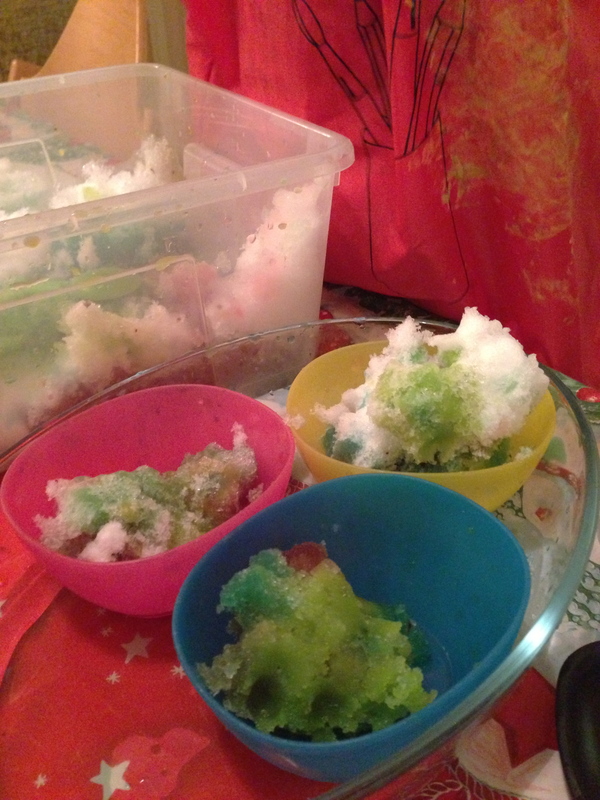 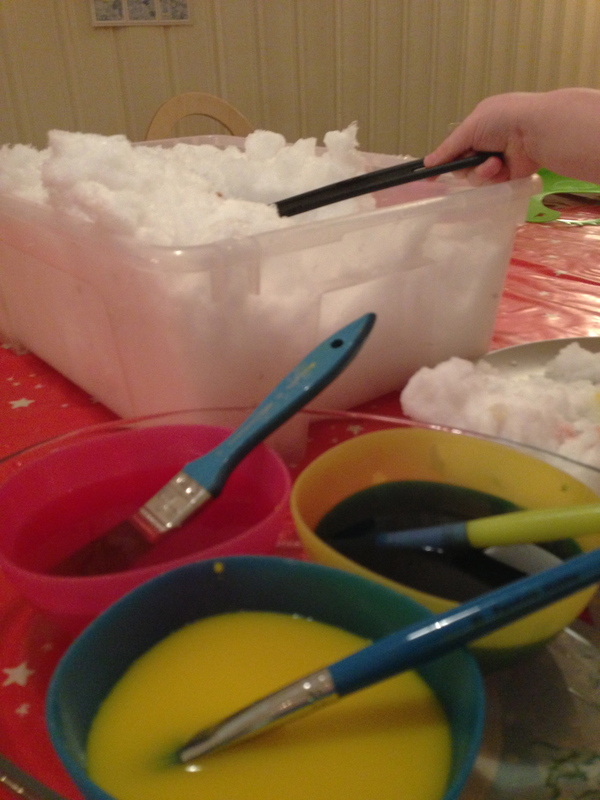 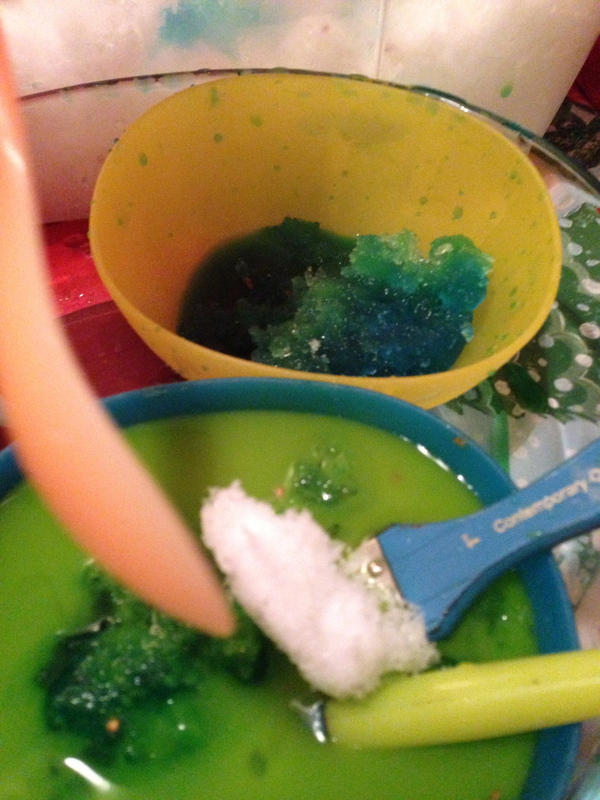 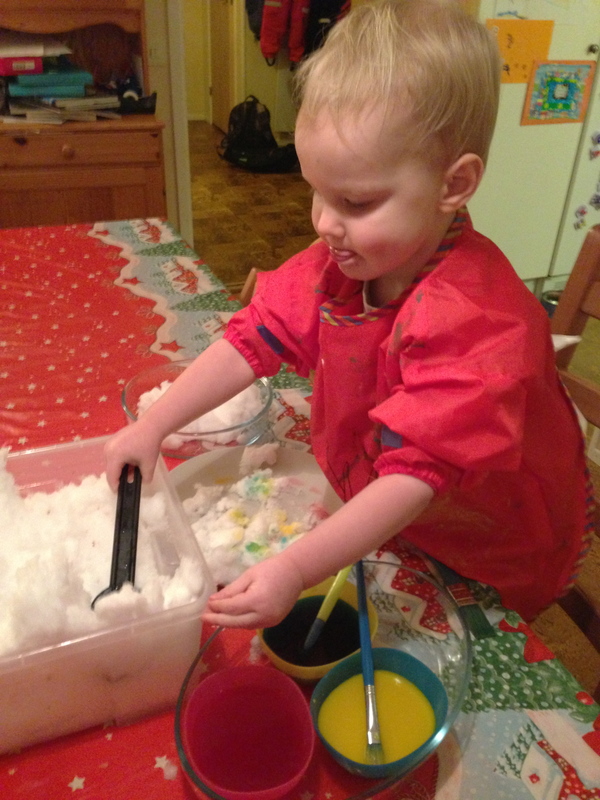 I had expected the colouring to go in to the vat of snow..
All in all, we had a much enjoyed activity, cold hands, and a beautiful rainbow colored slushy mess…! 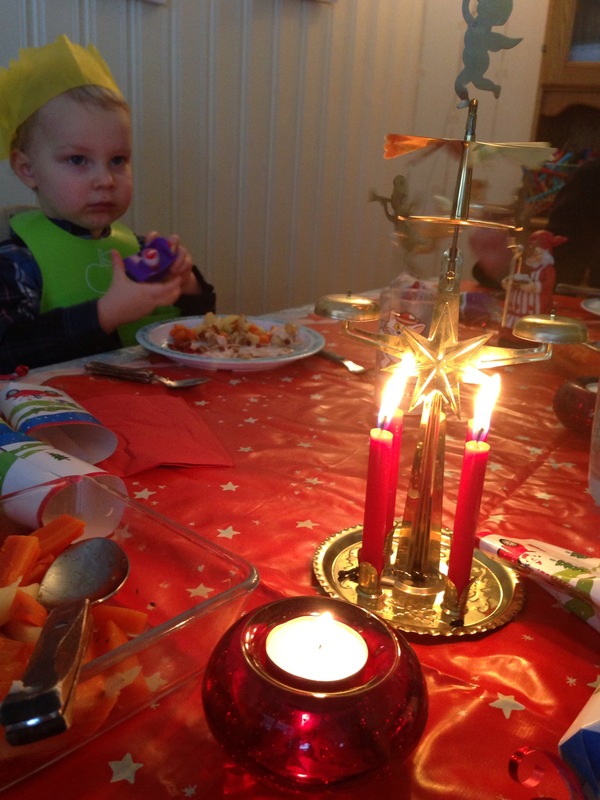 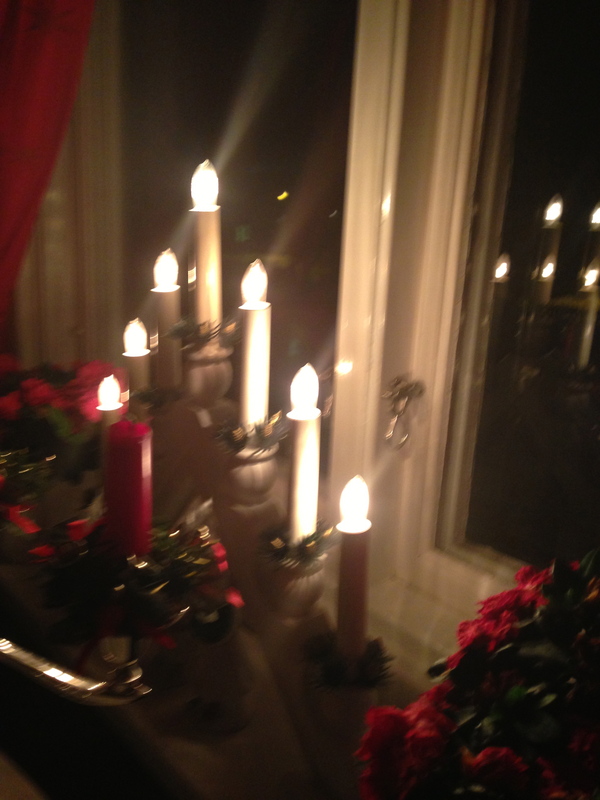 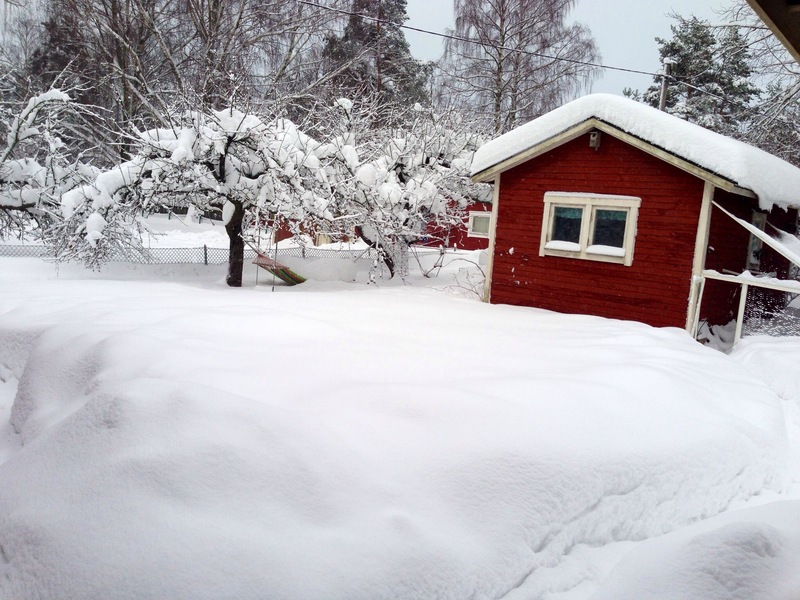 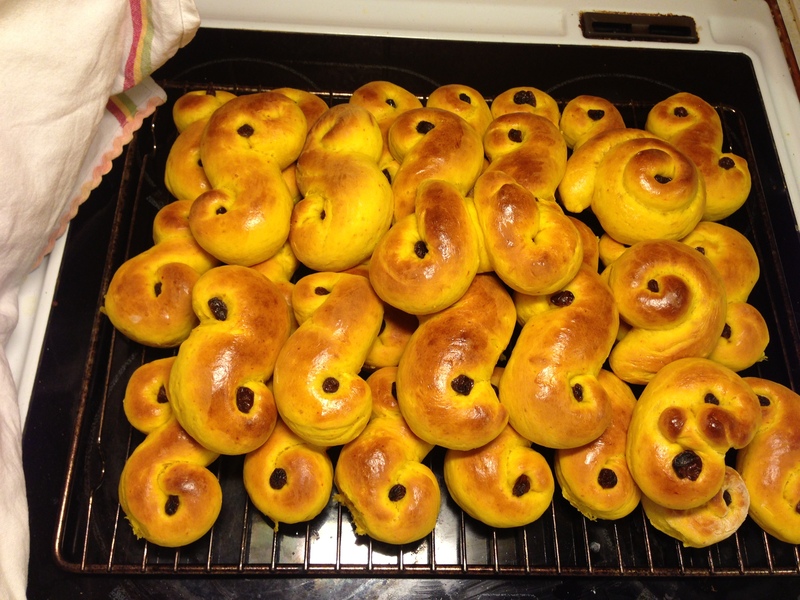 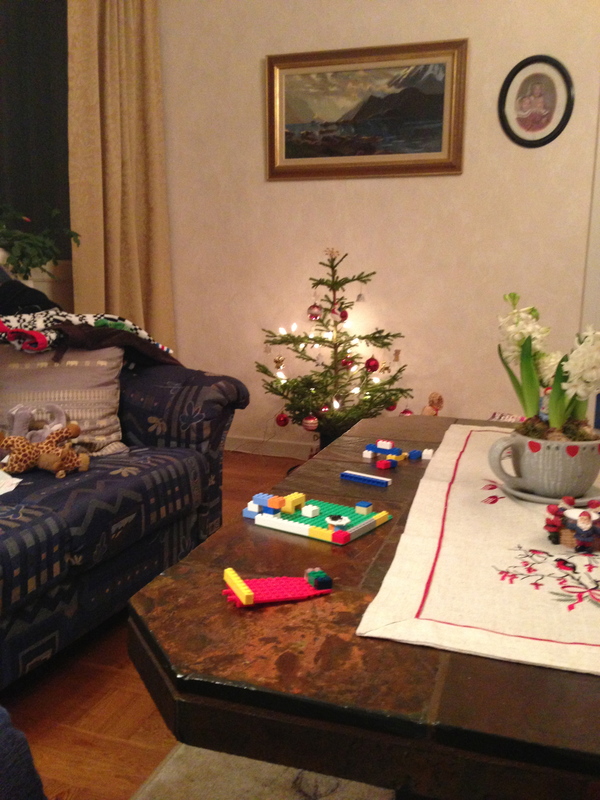 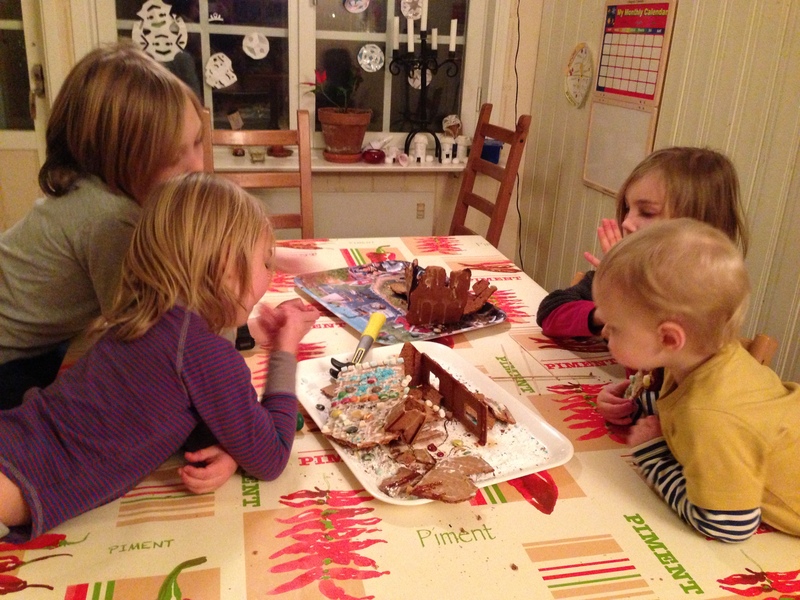 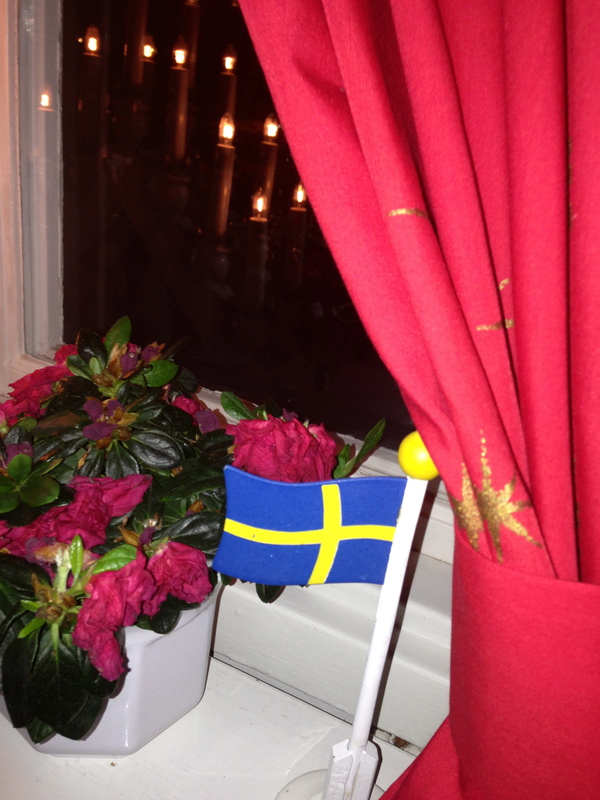 Christmas in Sweden ends on the 13th January. 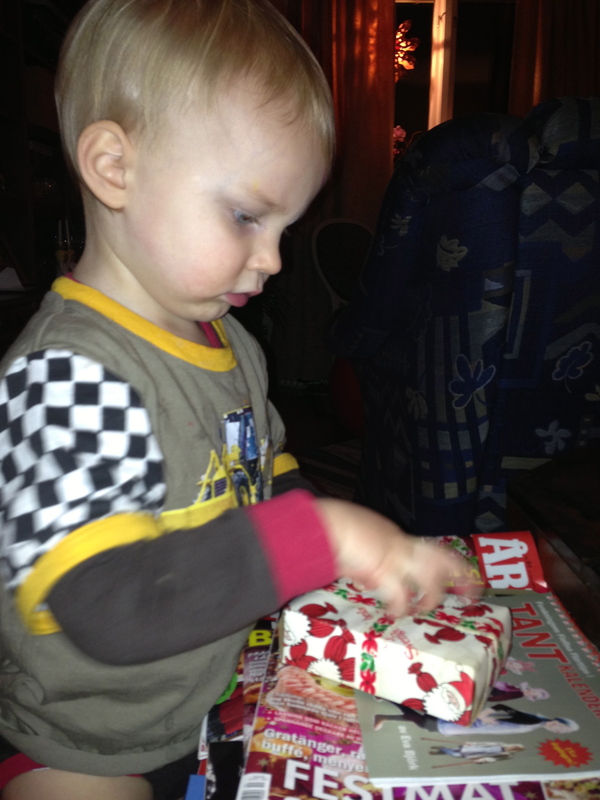 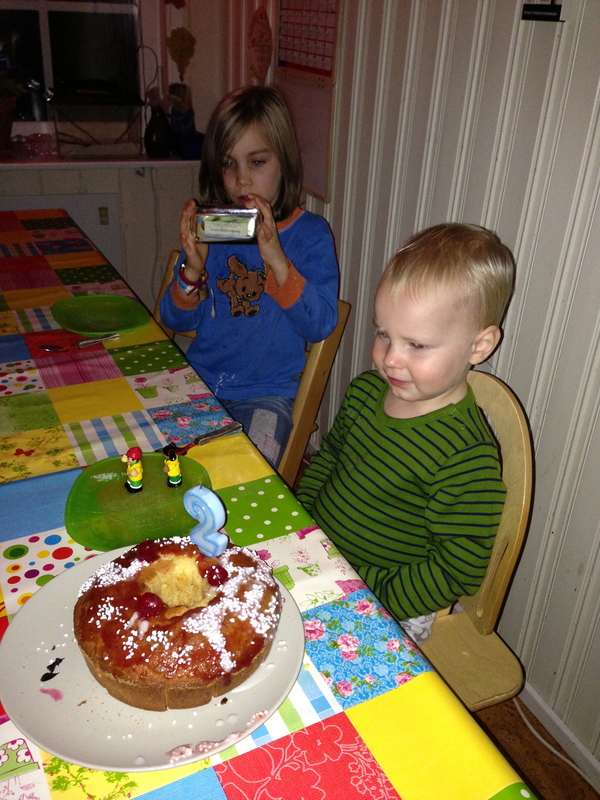 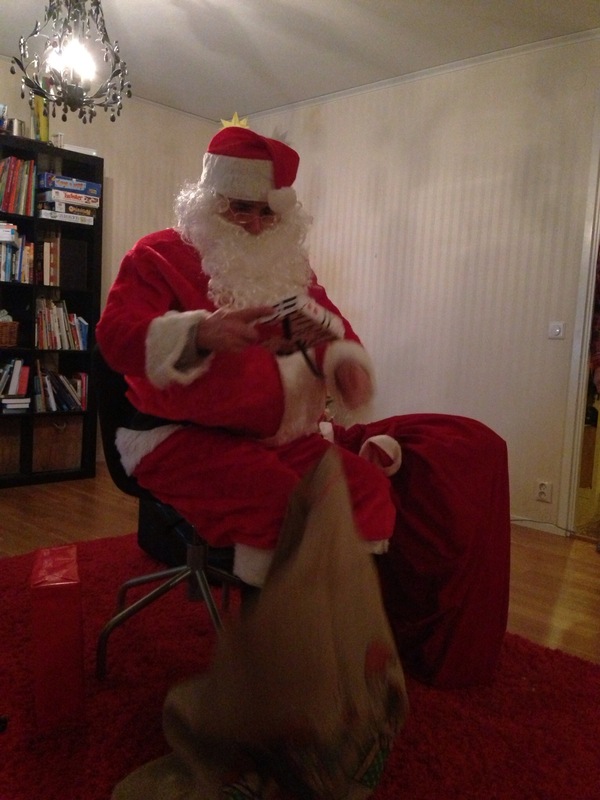 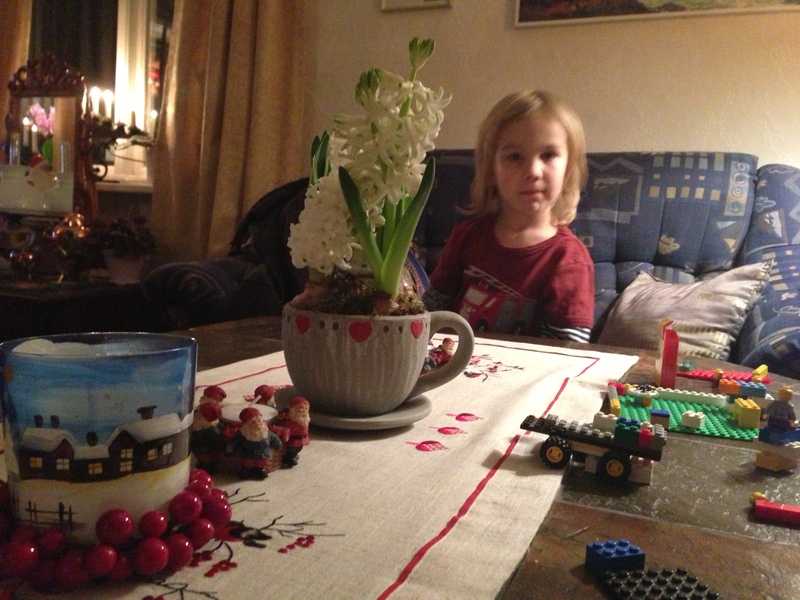 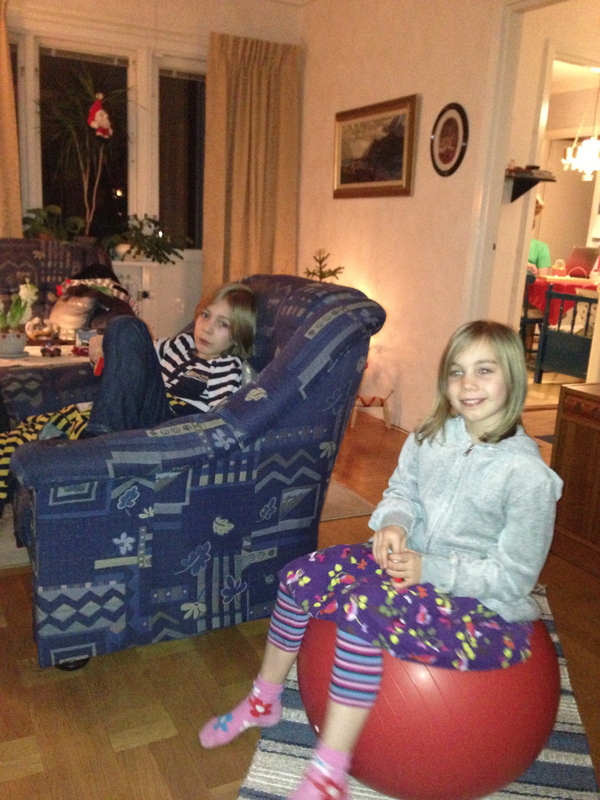 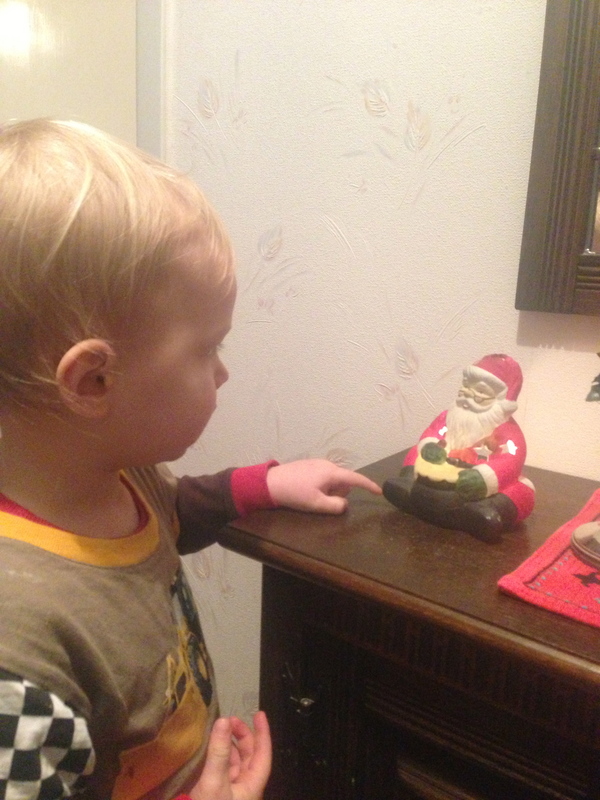 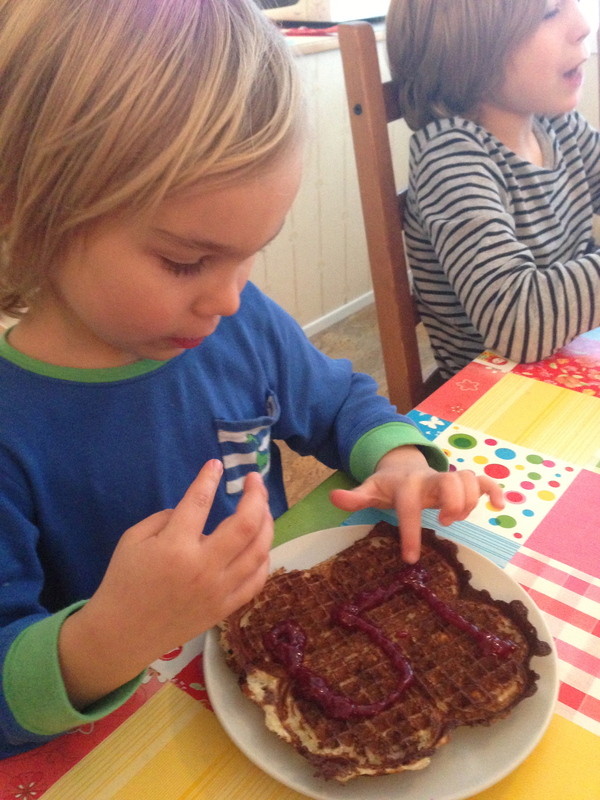 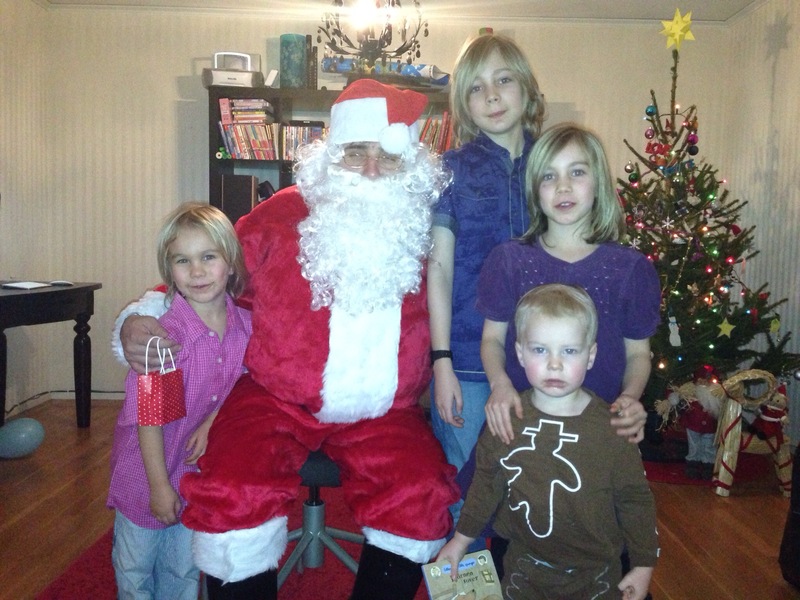 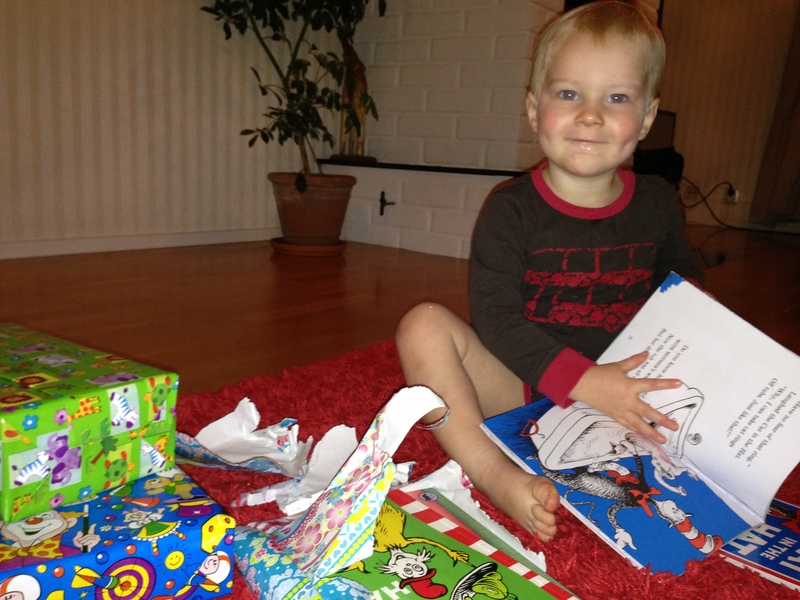 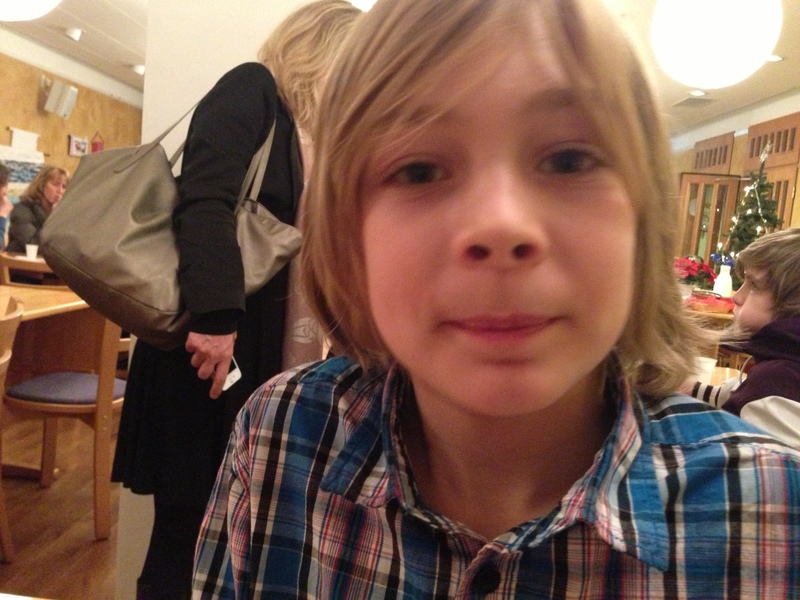 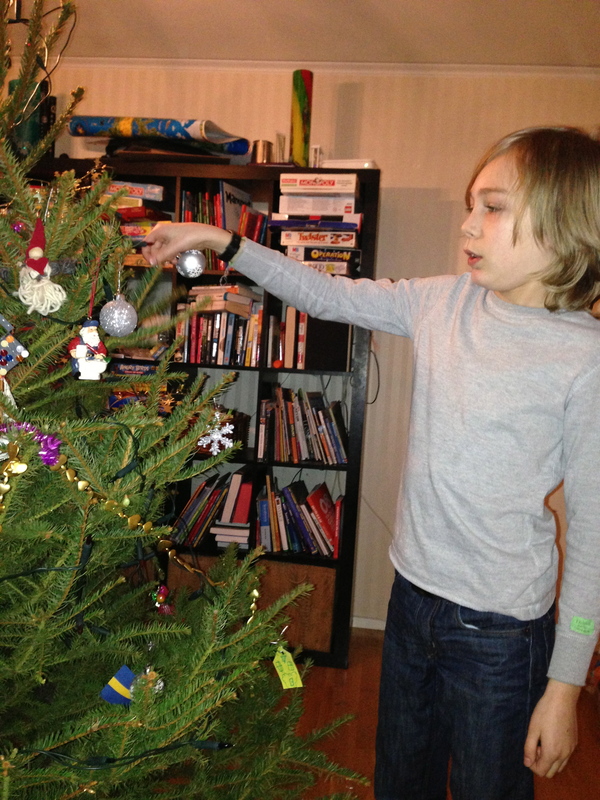 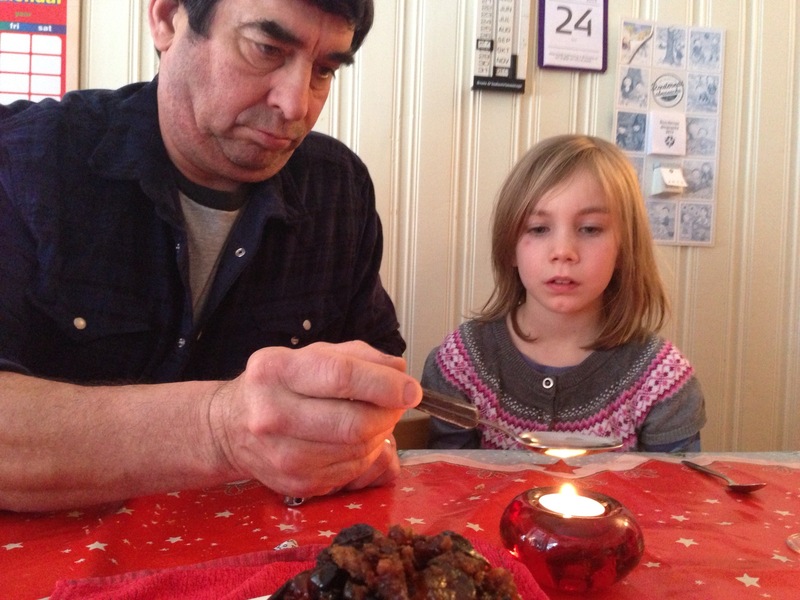 Twenty days after Christmas is Knut’s day – ‘tjugondag Knut’. 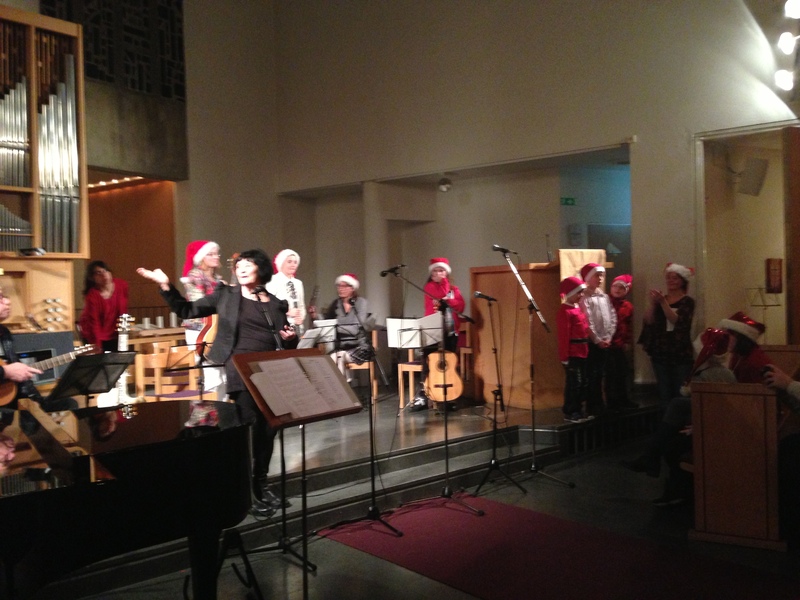 It starts with the dancing around the tree, songs which will also be sung at Midsummer..
…yes, we did do this, but no photos I’m afraid – too much dancing to be done! 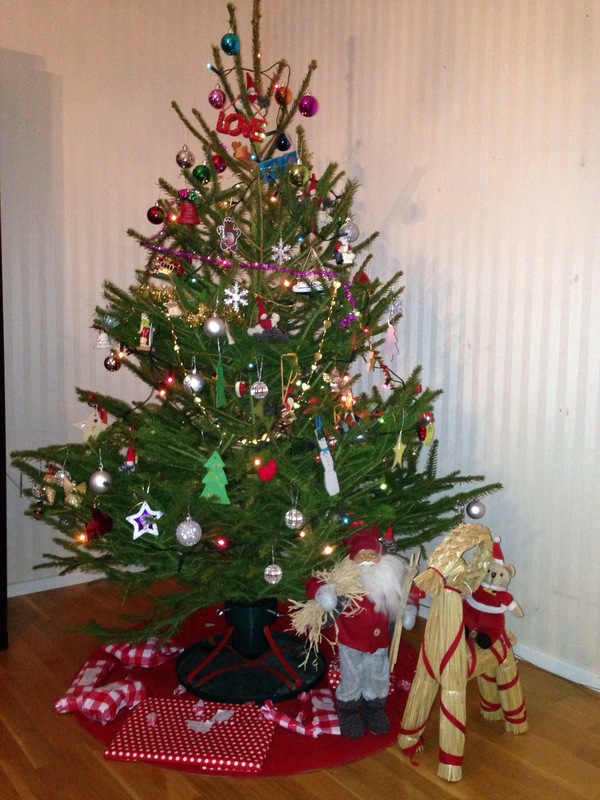 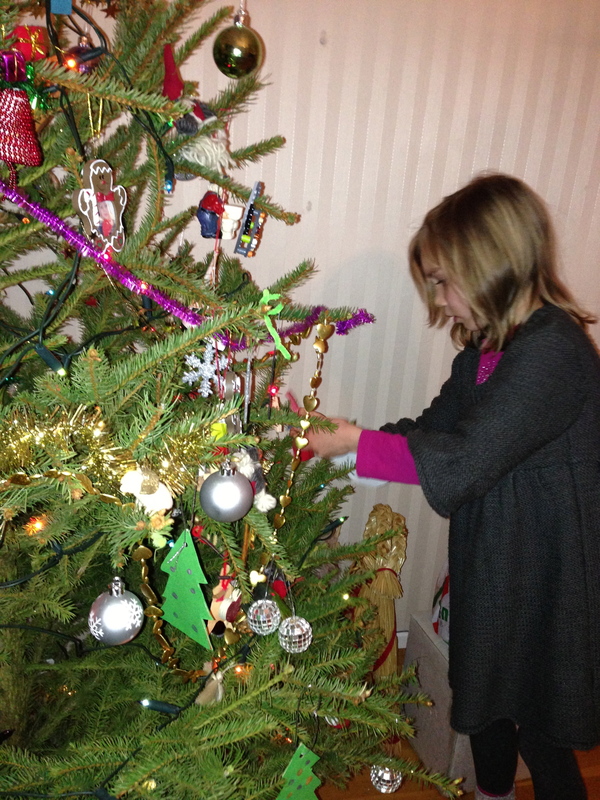 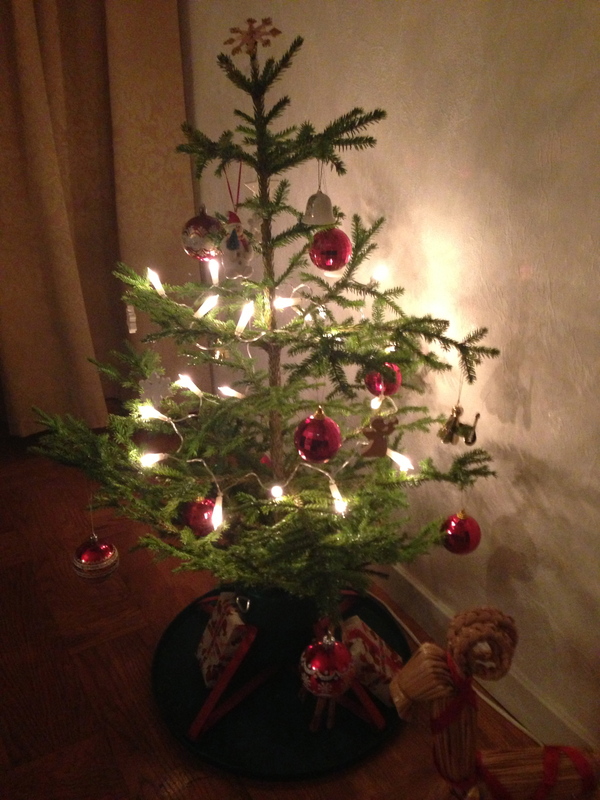 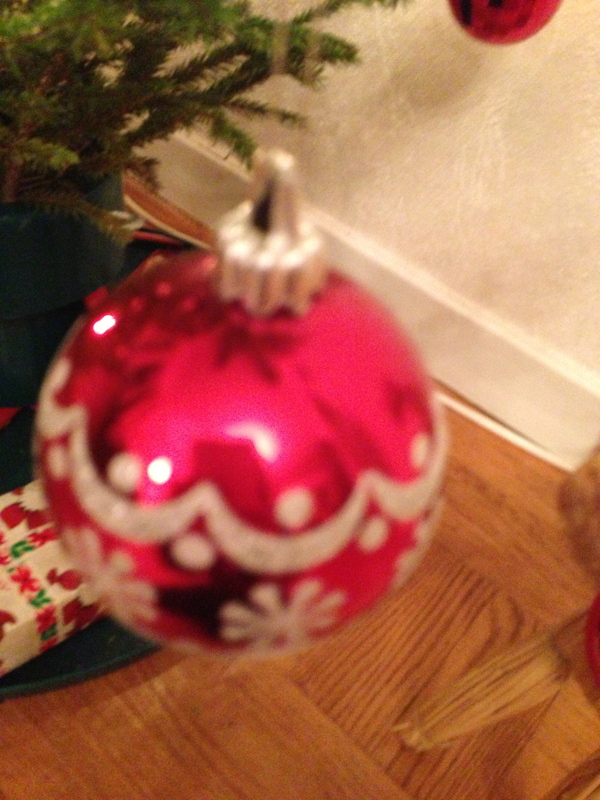 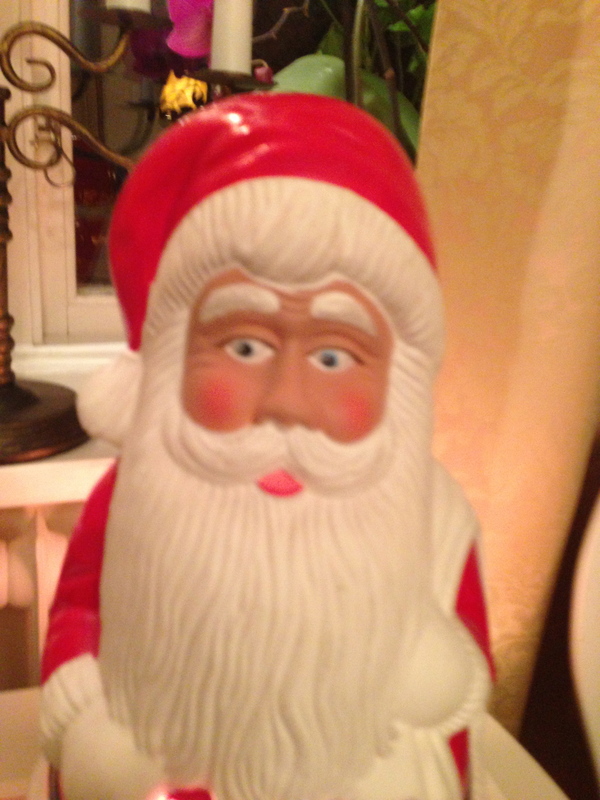 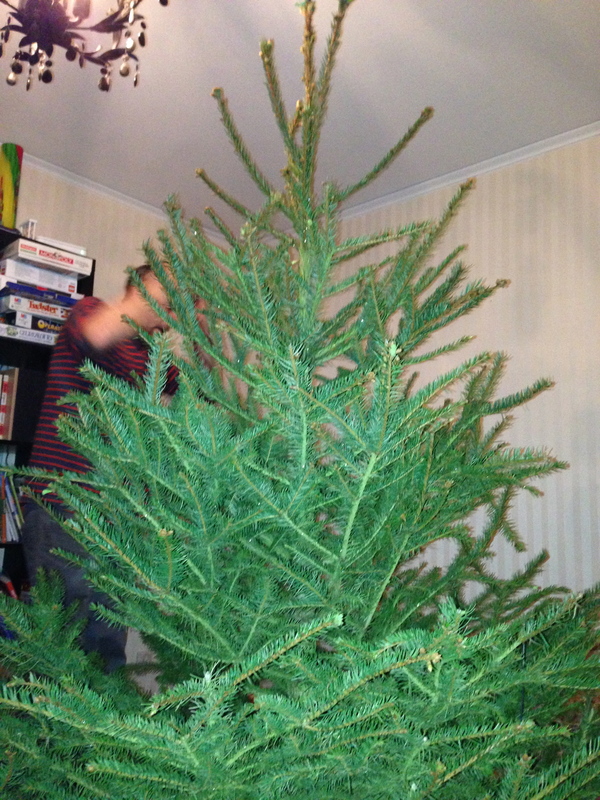 The tree is taken in to the garden, and the pine needles are hoovered up…. 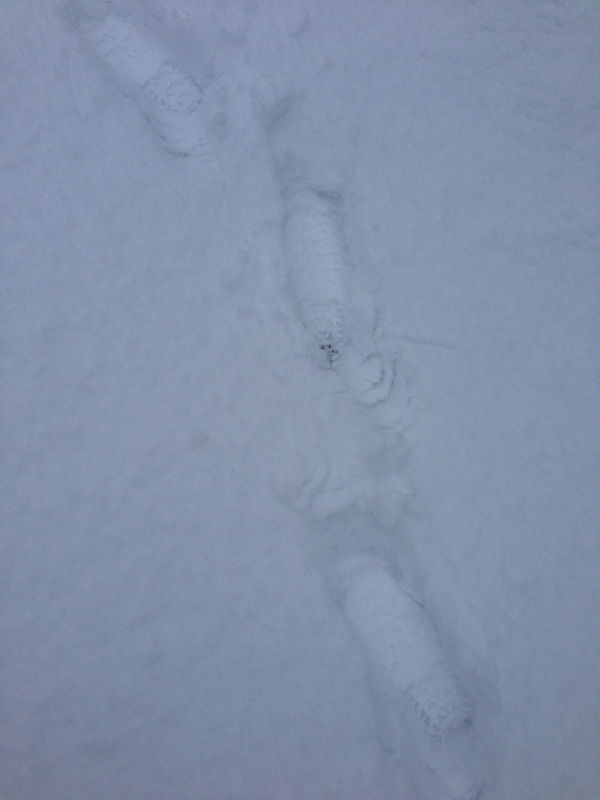 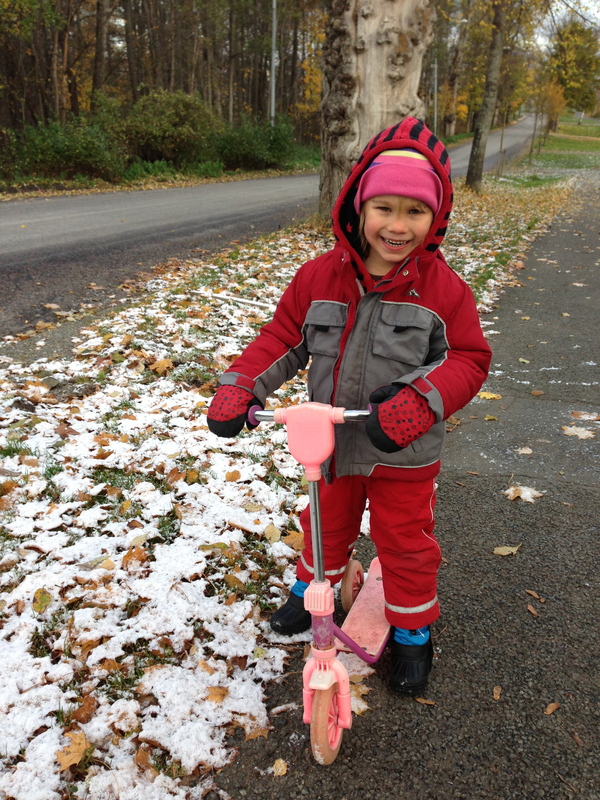 Yesterday some new snow fell – and of course we had to go outside! 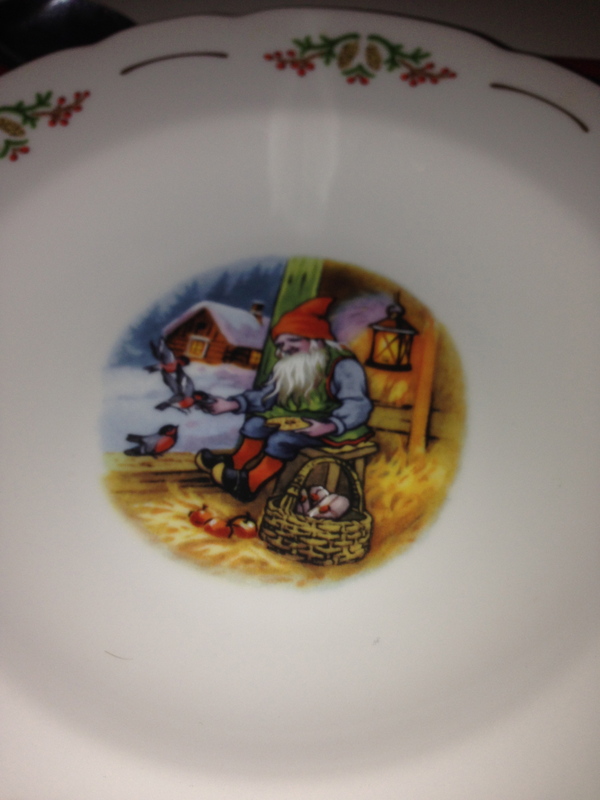 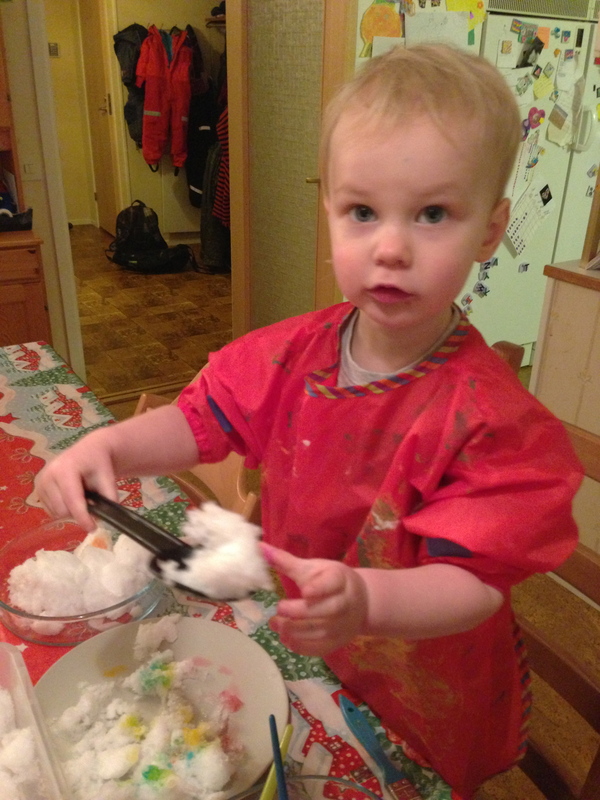 Having just read ‘The Snowy Day’, I think he had been inspired…. 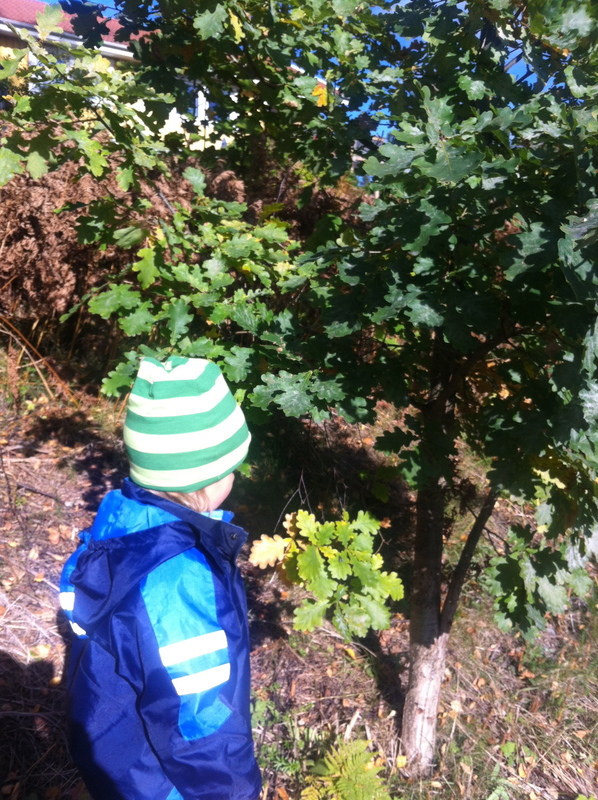 But unlike Peter, we couldn’t find a stick to make tracks, and we couldn’t find a ‘mountain’ to climb. 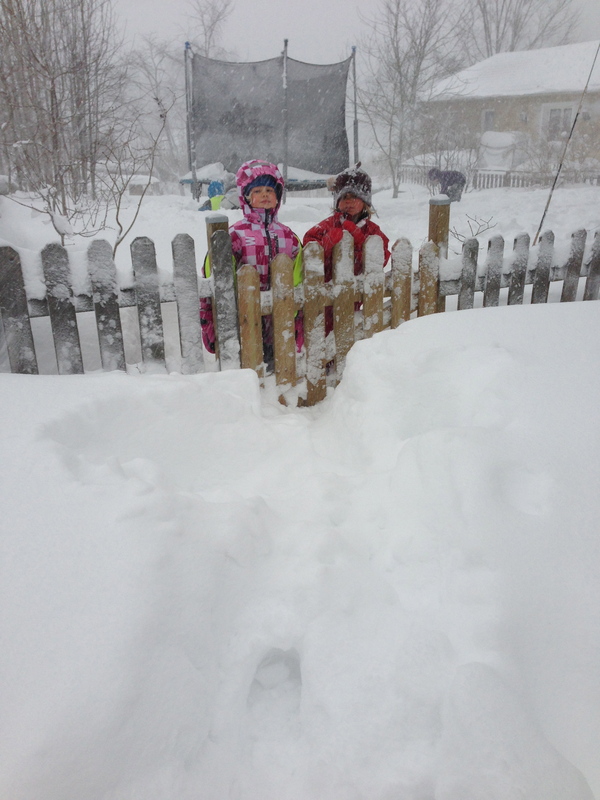 We didn’t see any big kids having a snowball fight, and we didn’t build a snowman or make snow angels. 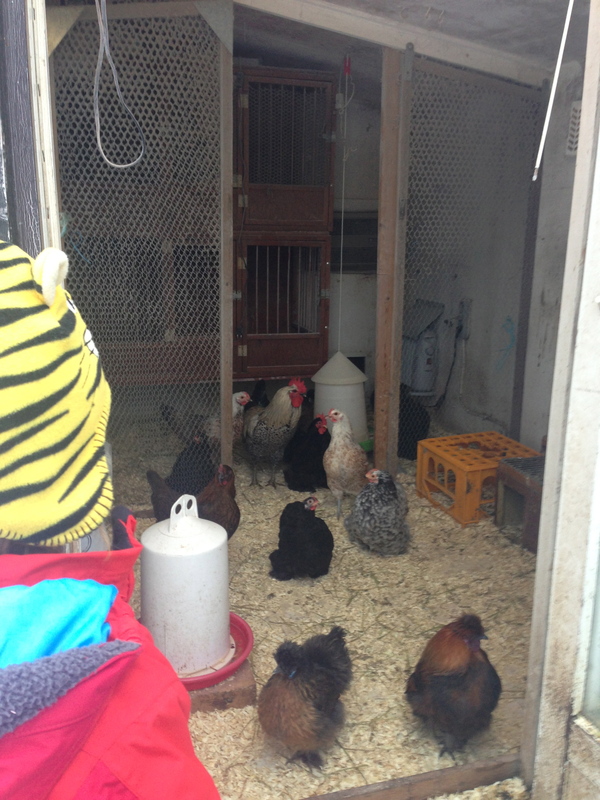 No…instead, unlike Peter, we discovered new neighbours. 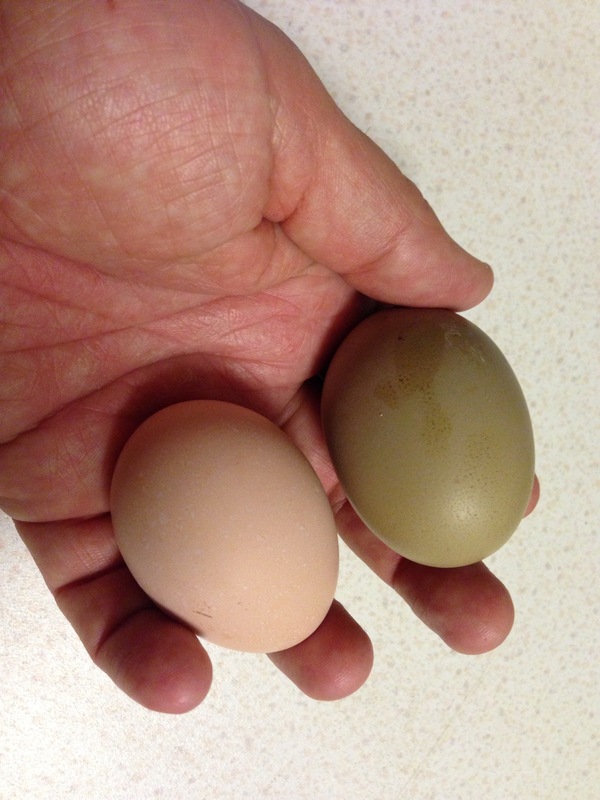 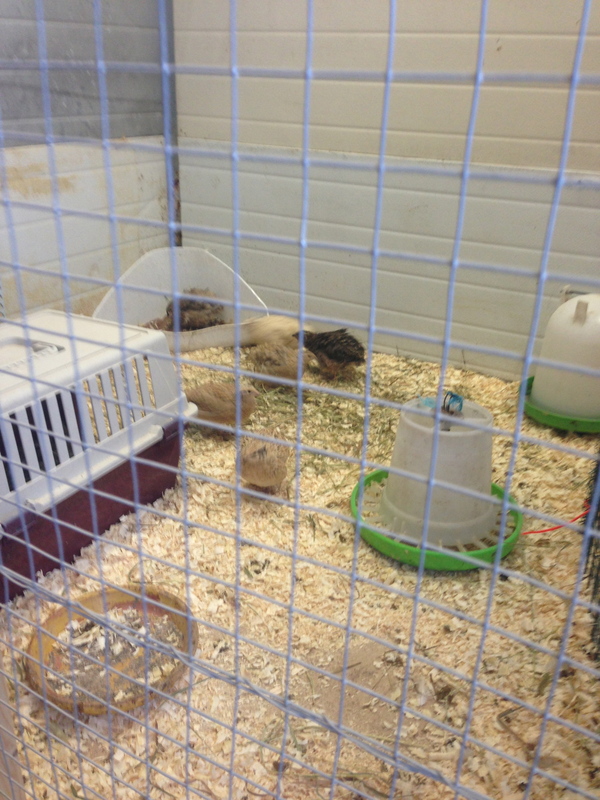 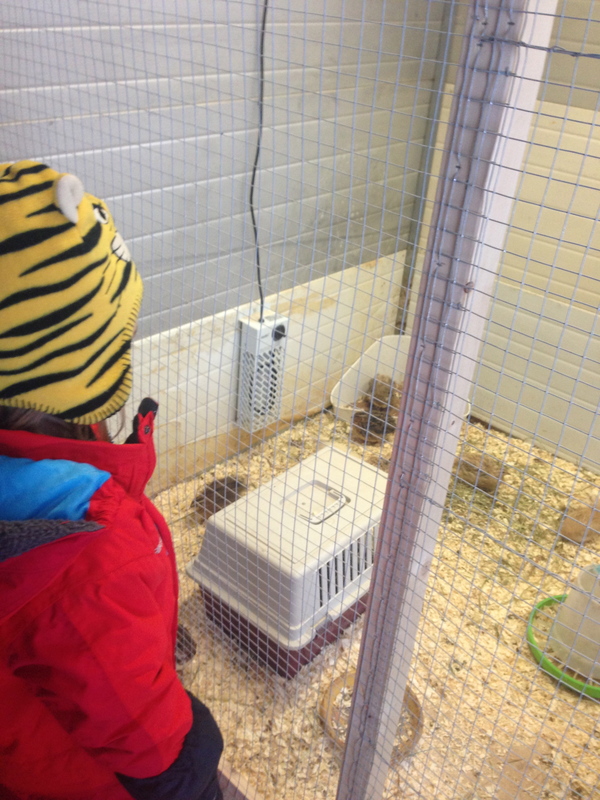 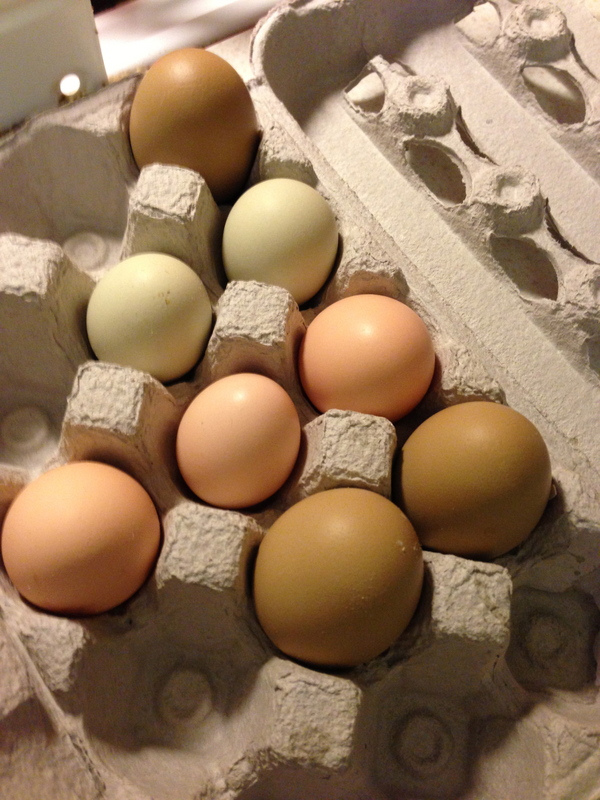 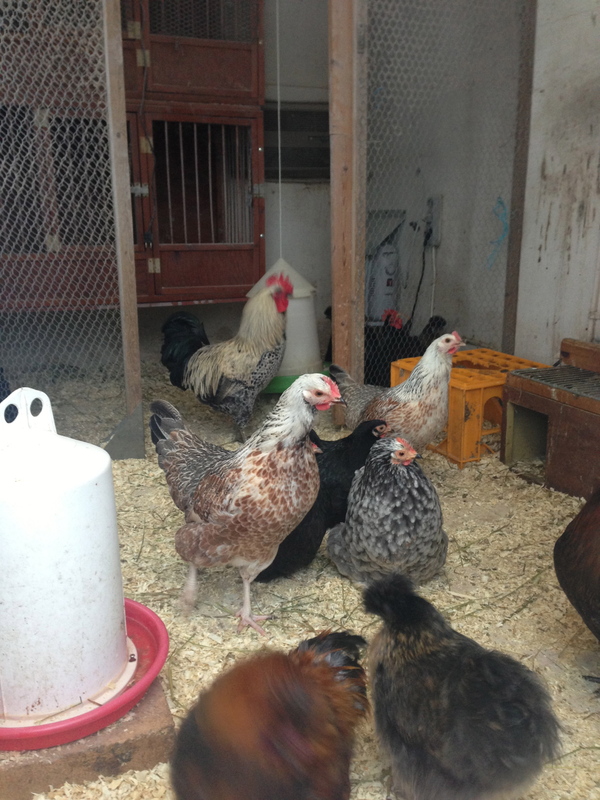 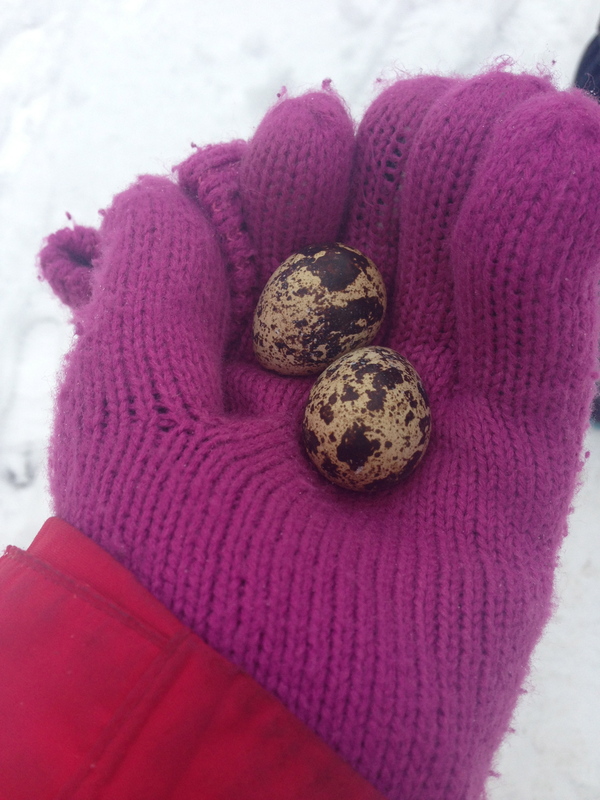 And not just chickens – quails too! 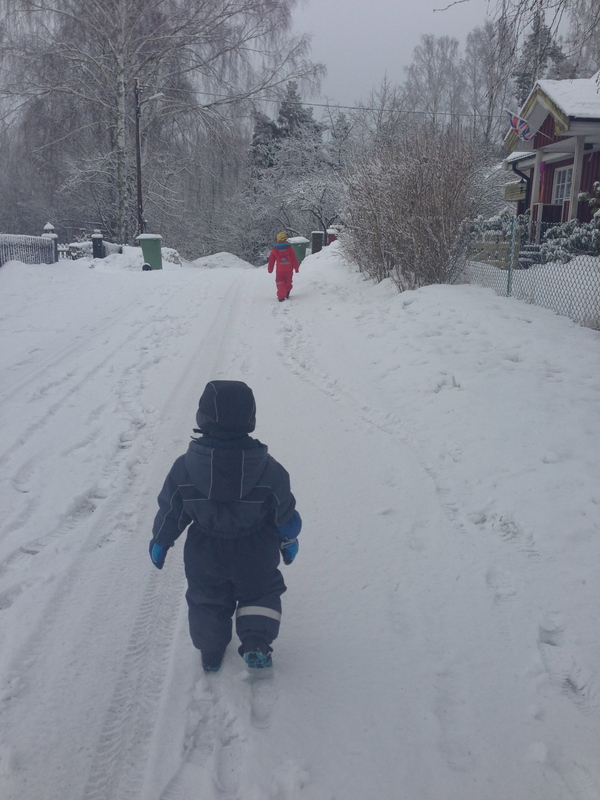 And unlike Peter we didn’t come home with a snowball. 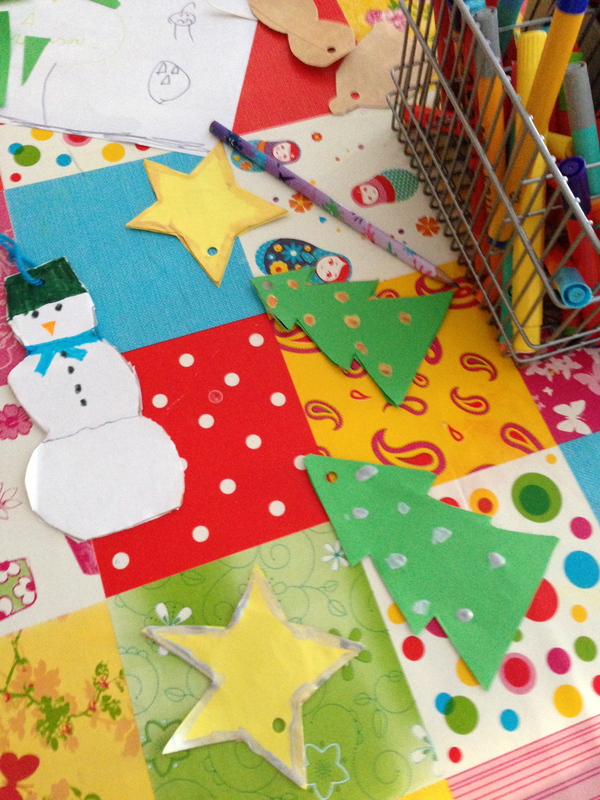 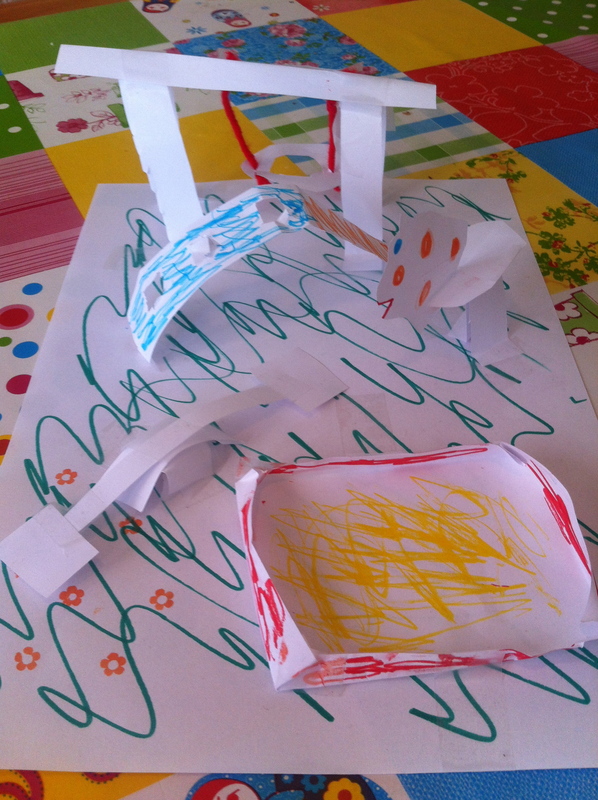 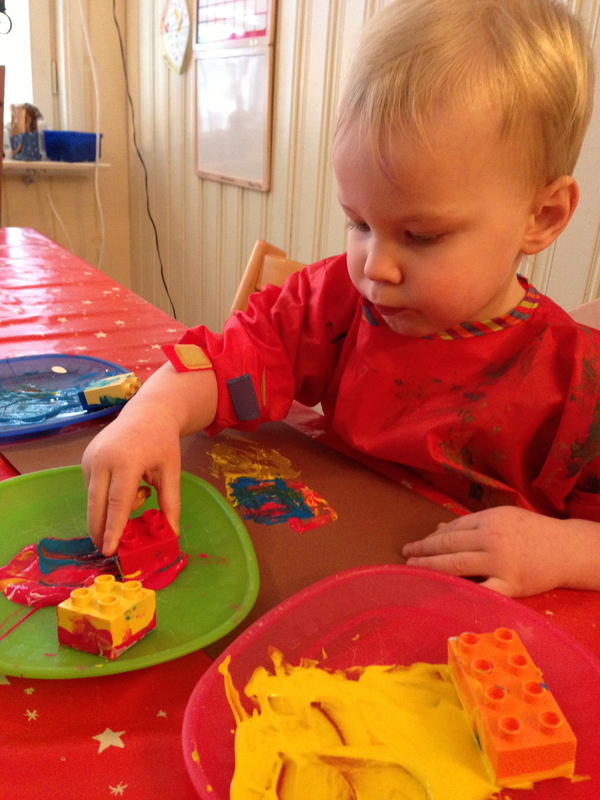 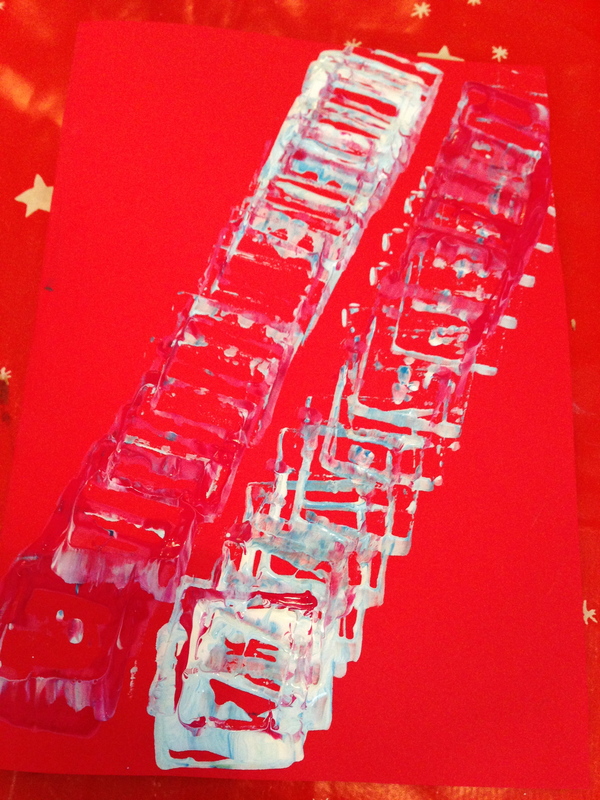 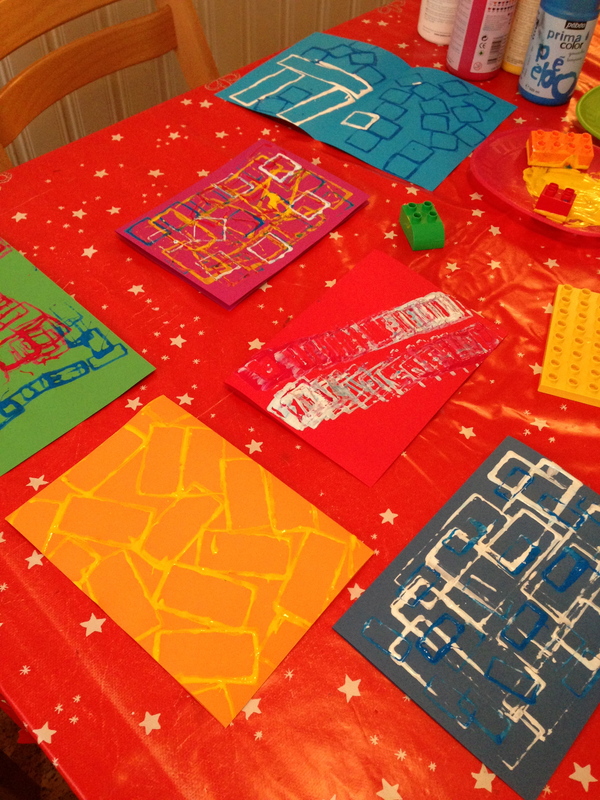 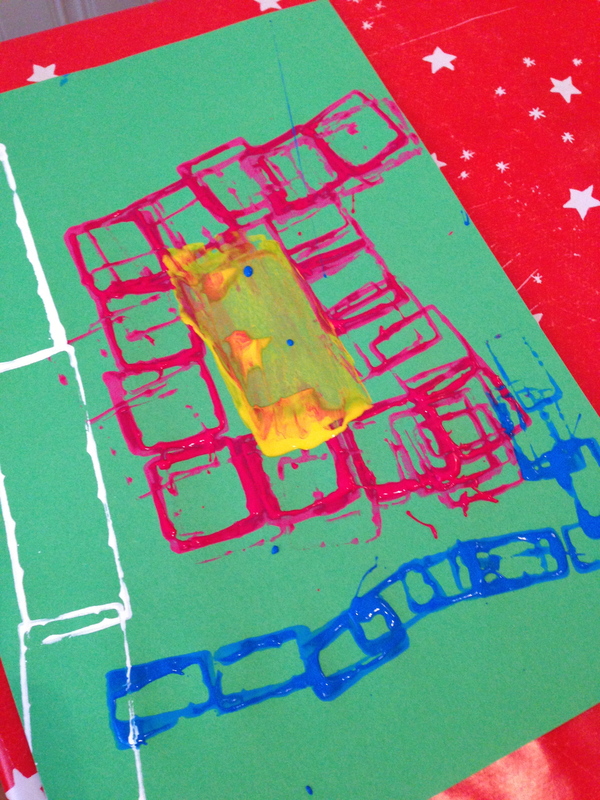 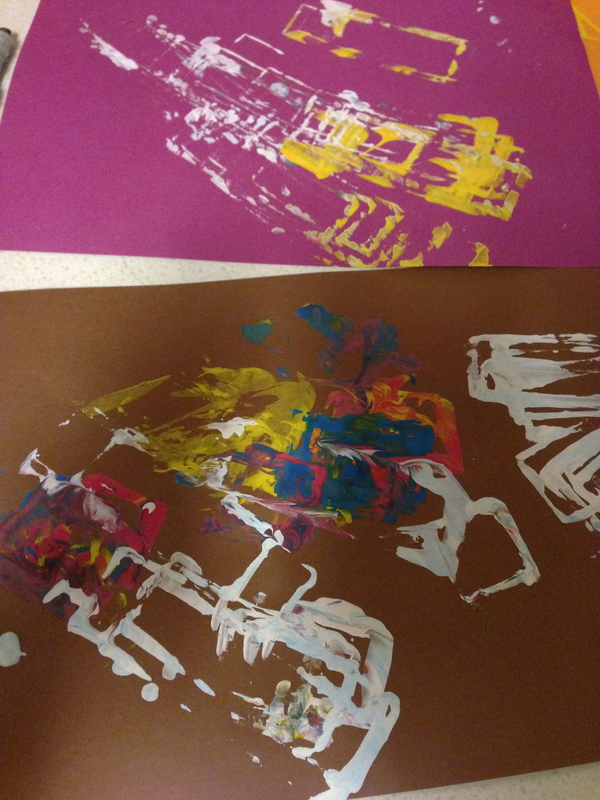 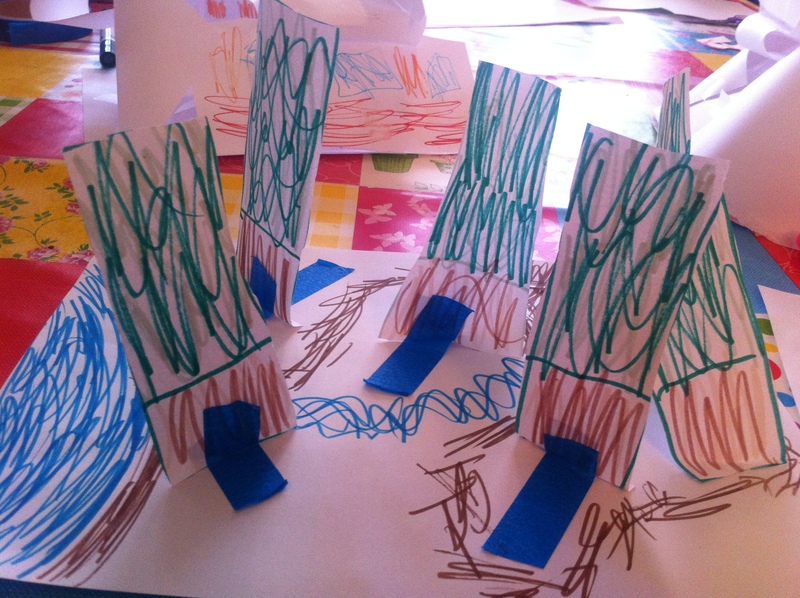 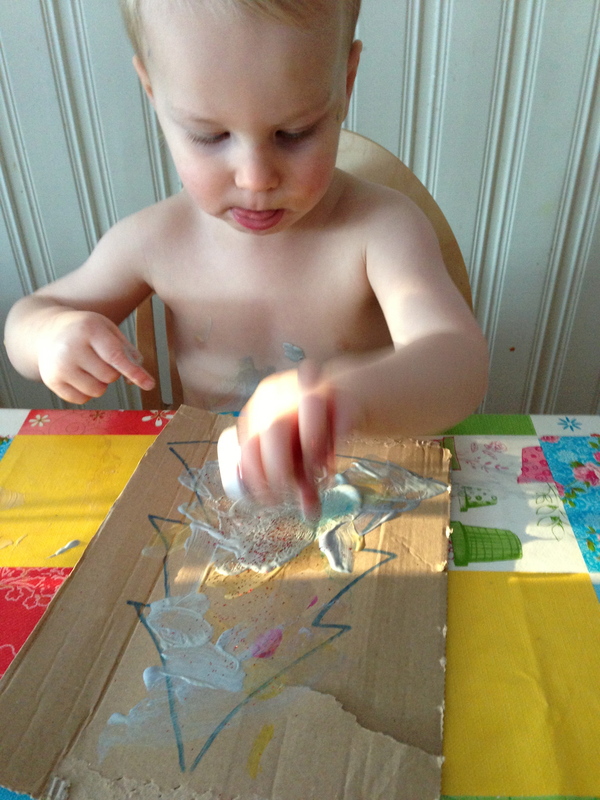 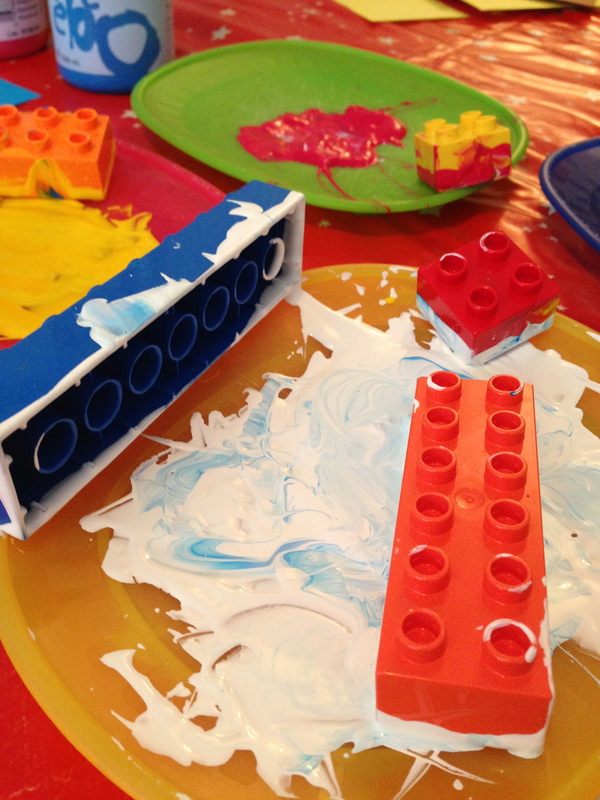 Such a simple art activity. 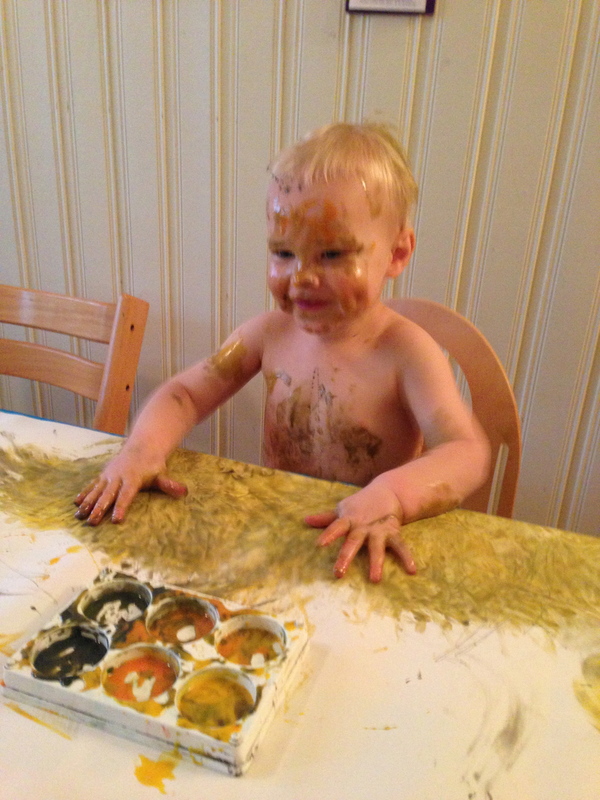 …and fun to plop down…! 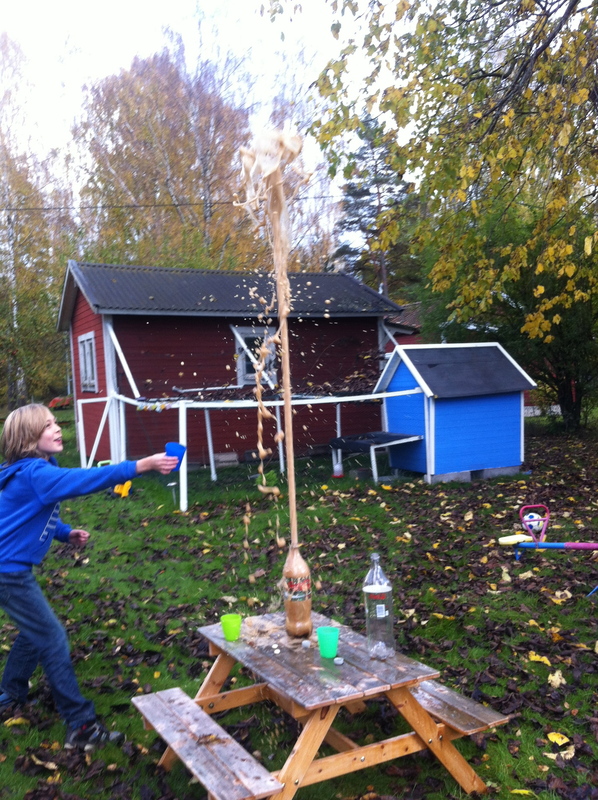 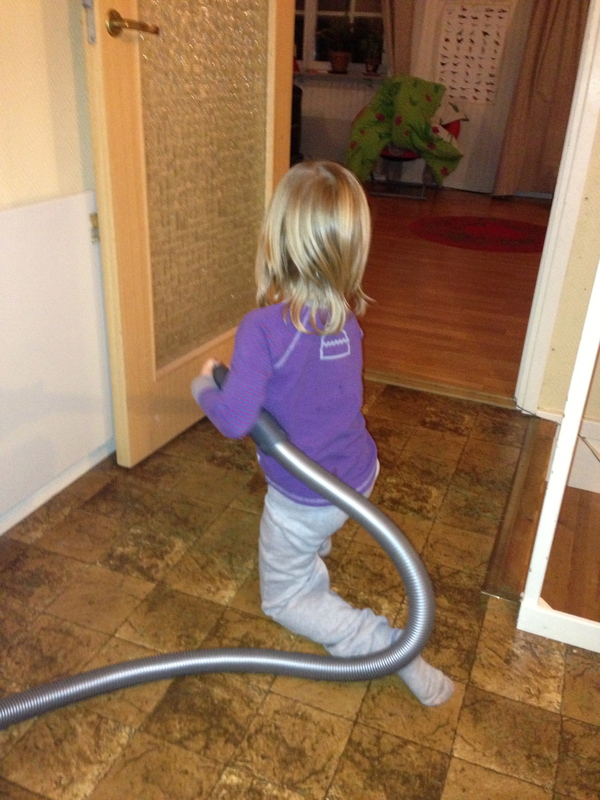 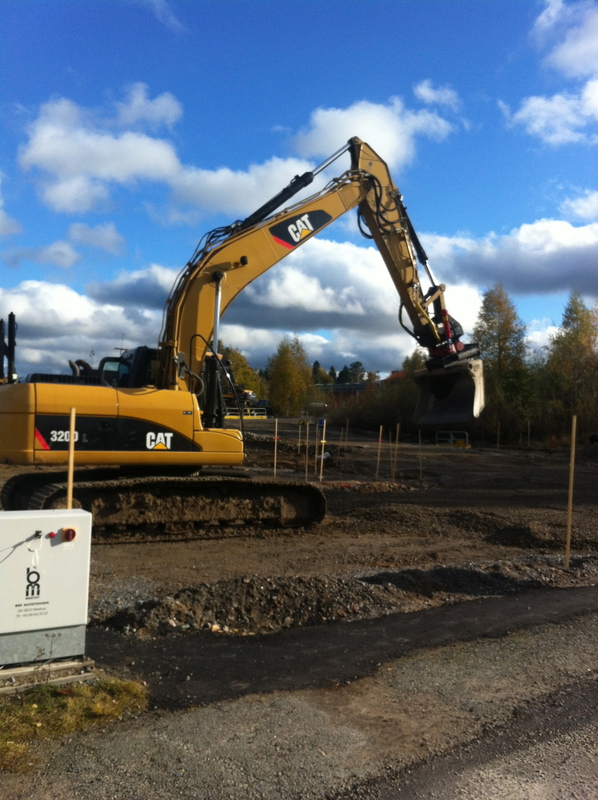 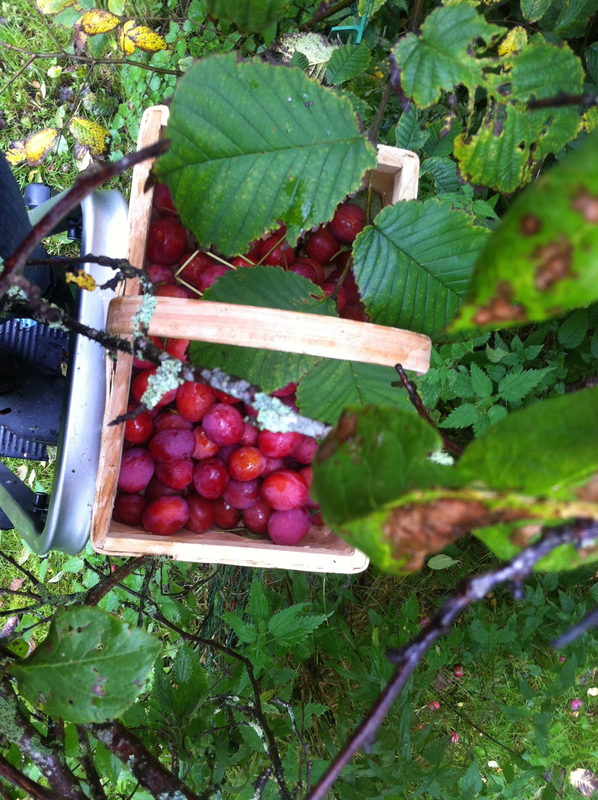 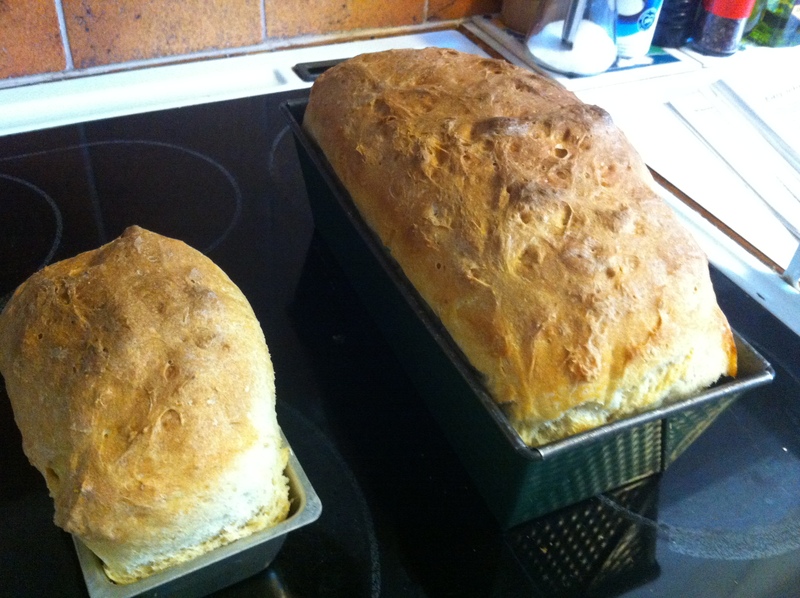 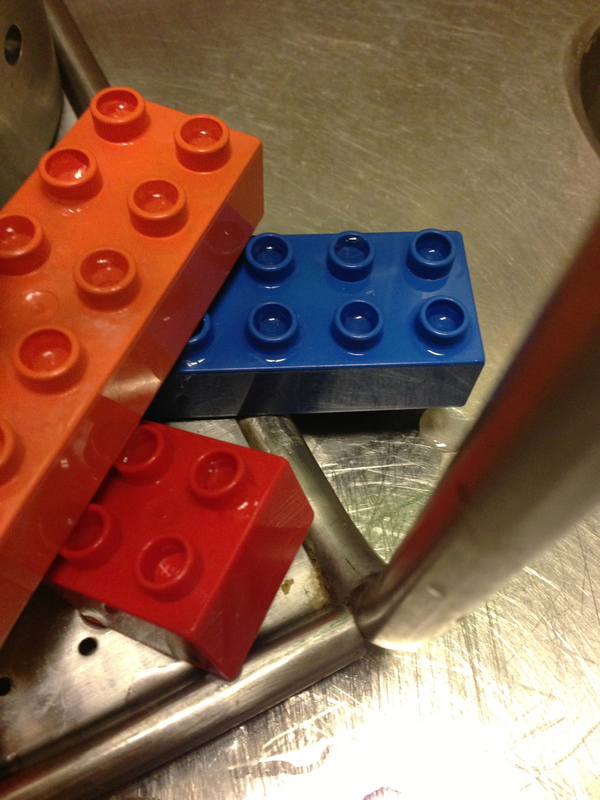 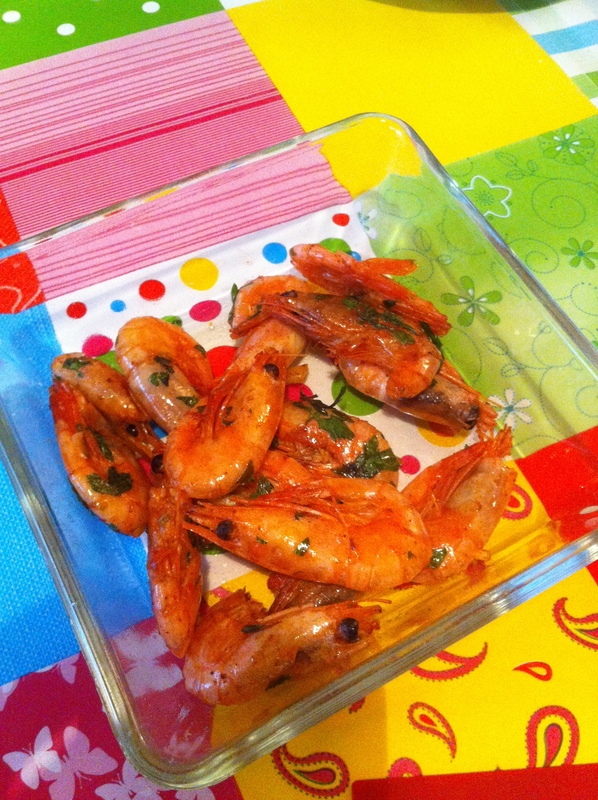 ….and so easy to clean up! 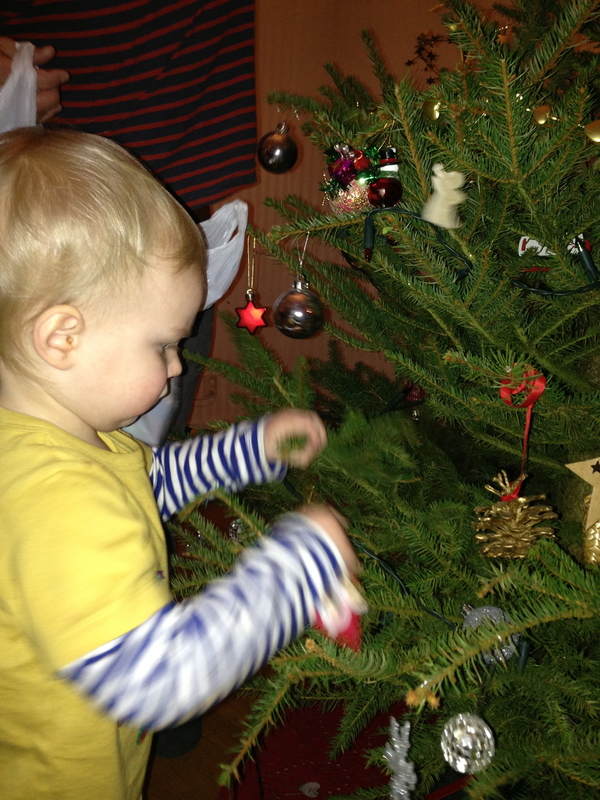 Six months on, and here we are again! 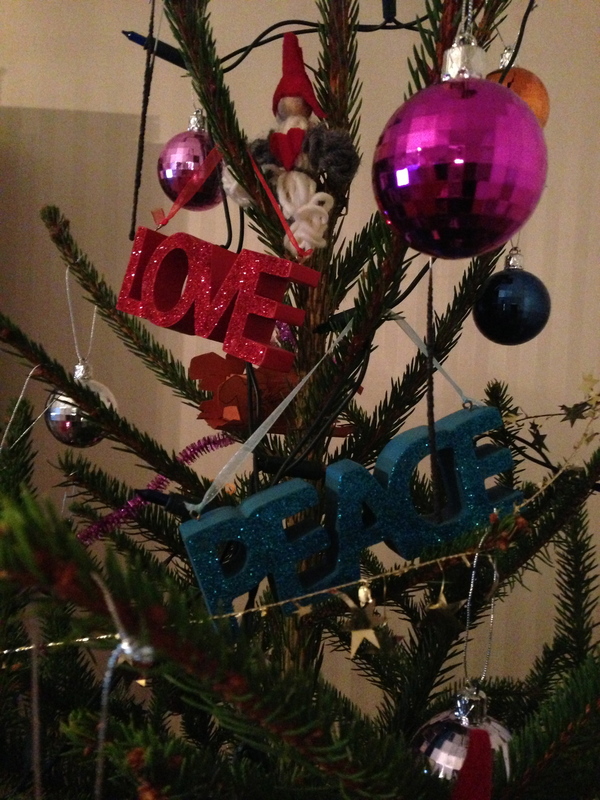 We are well, and happy, and I have admittedly enjoyed the blog break – but missed it at times too…! 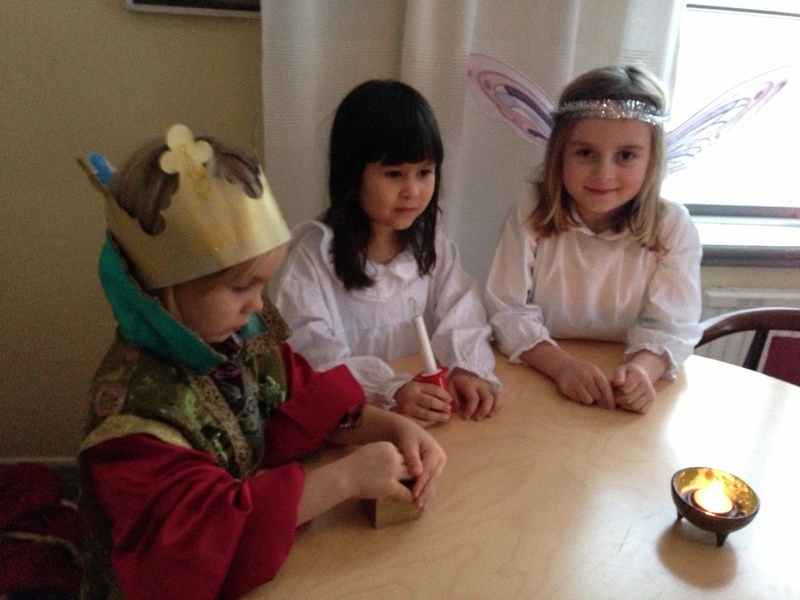 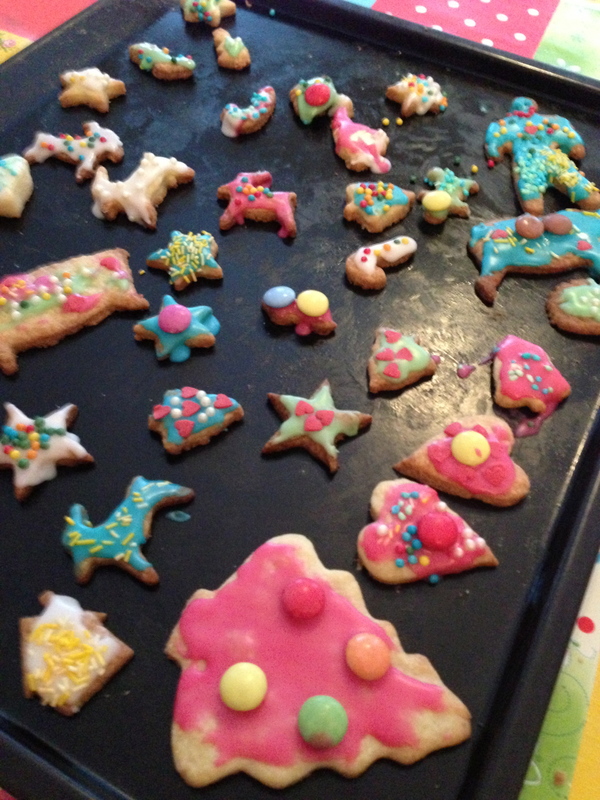 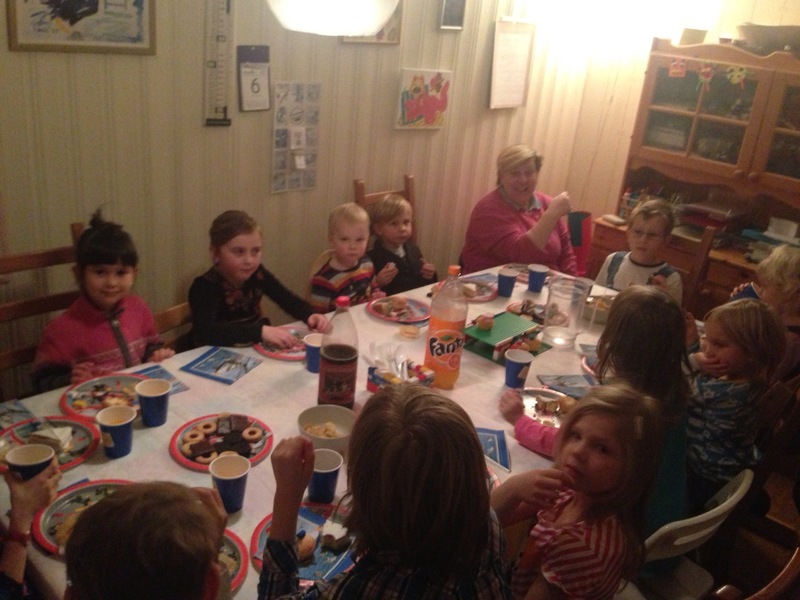 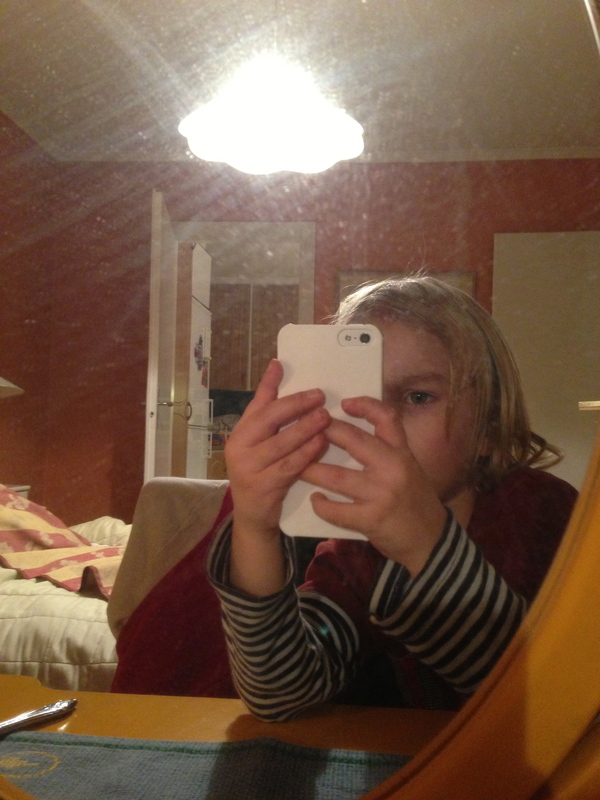 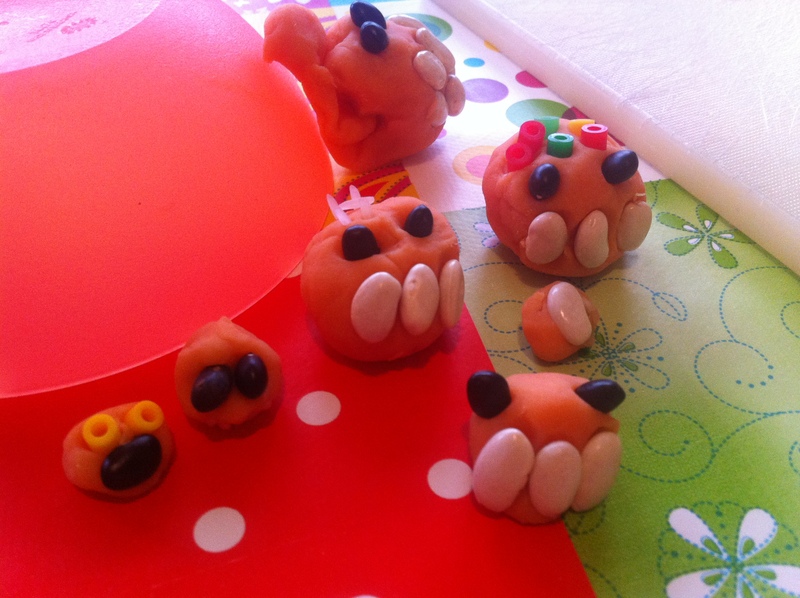 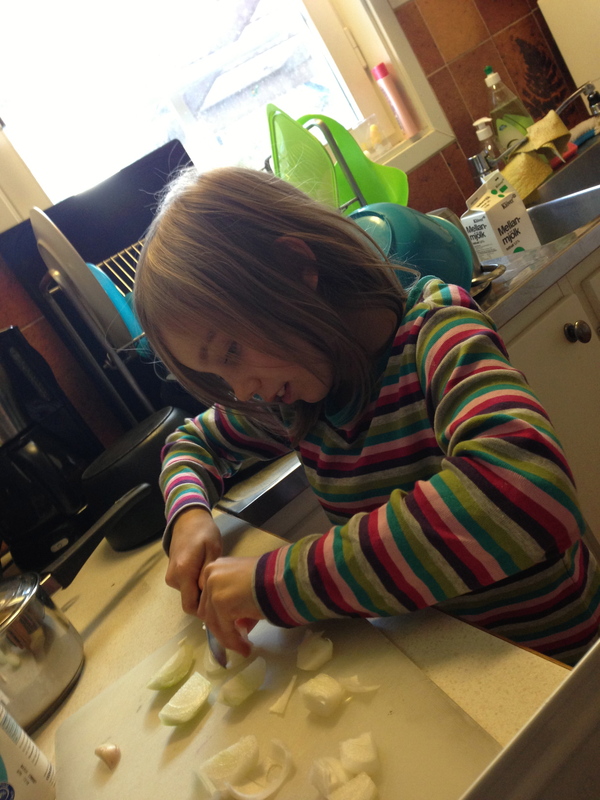 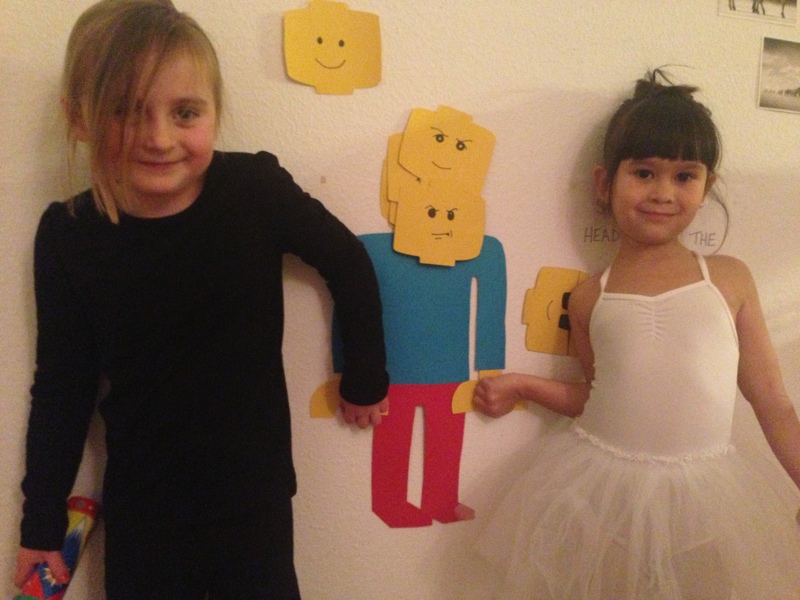 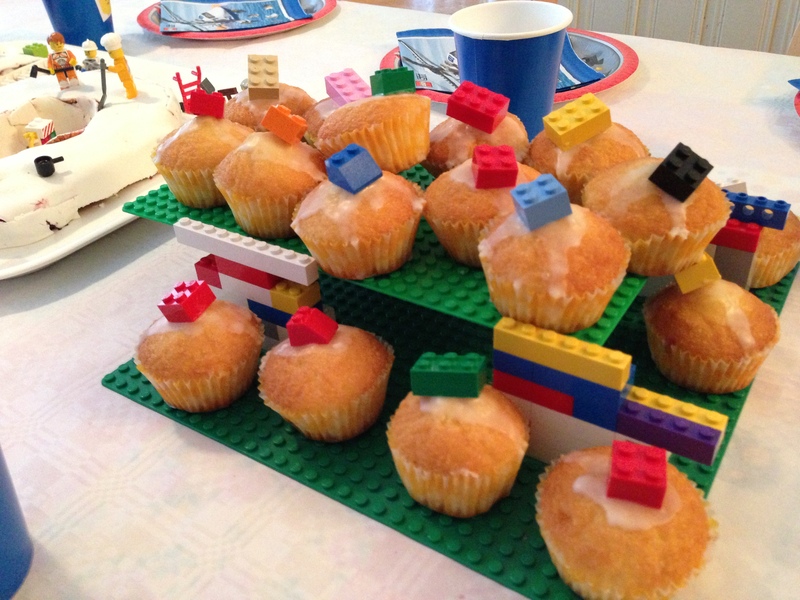 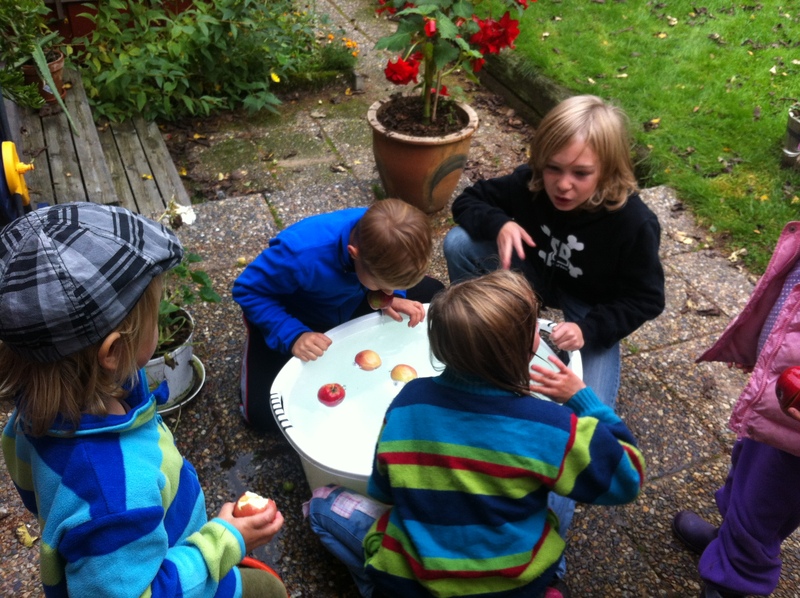 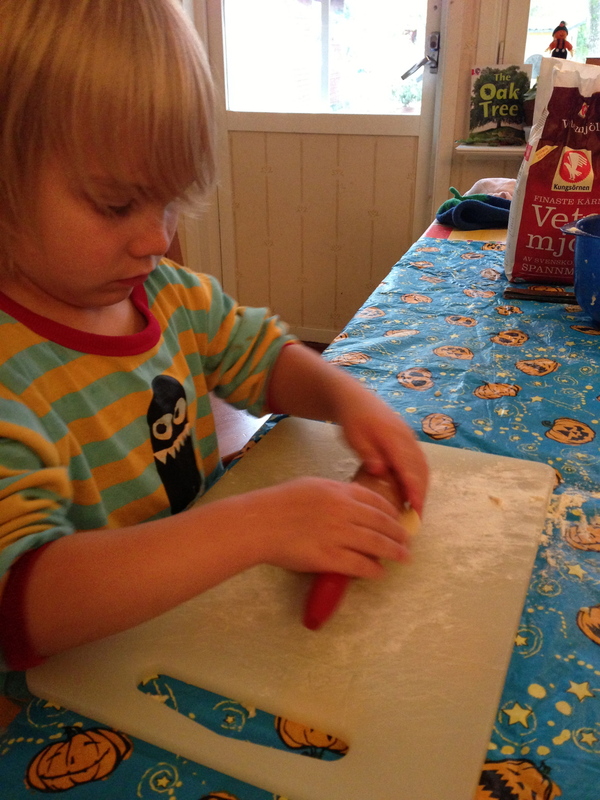 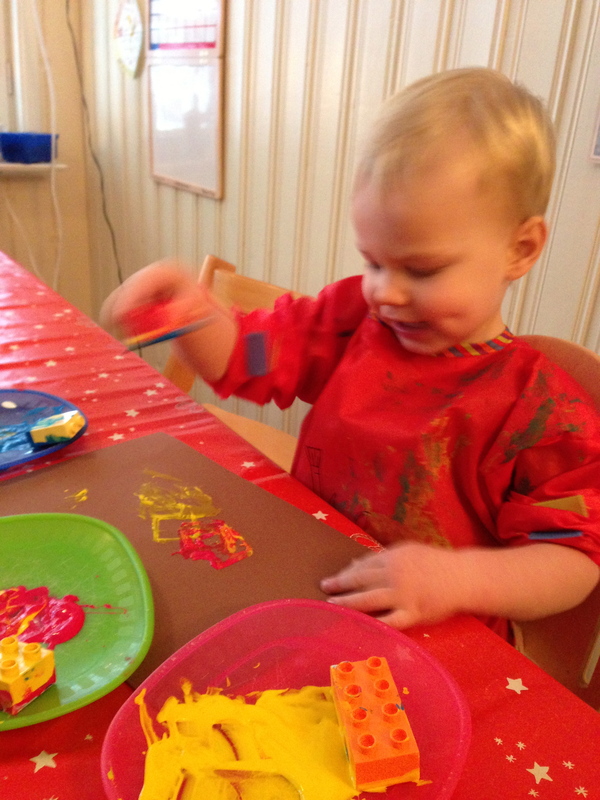 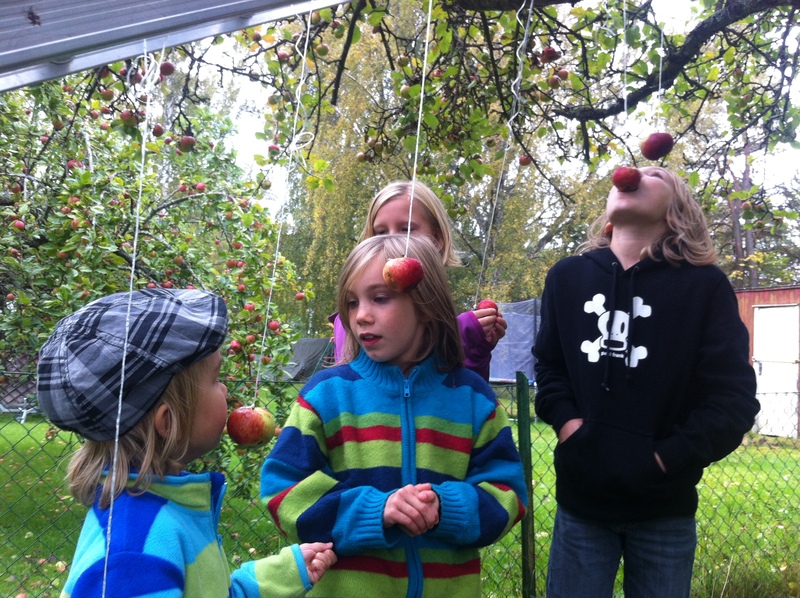 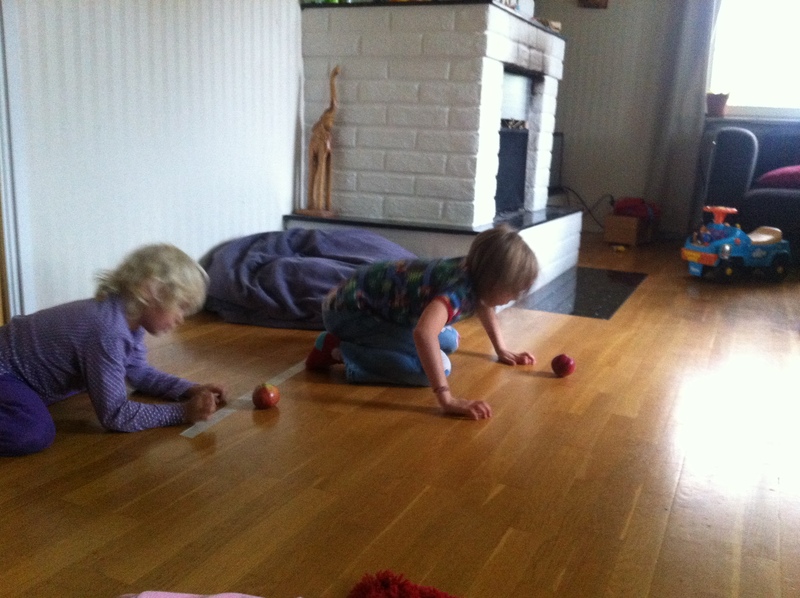 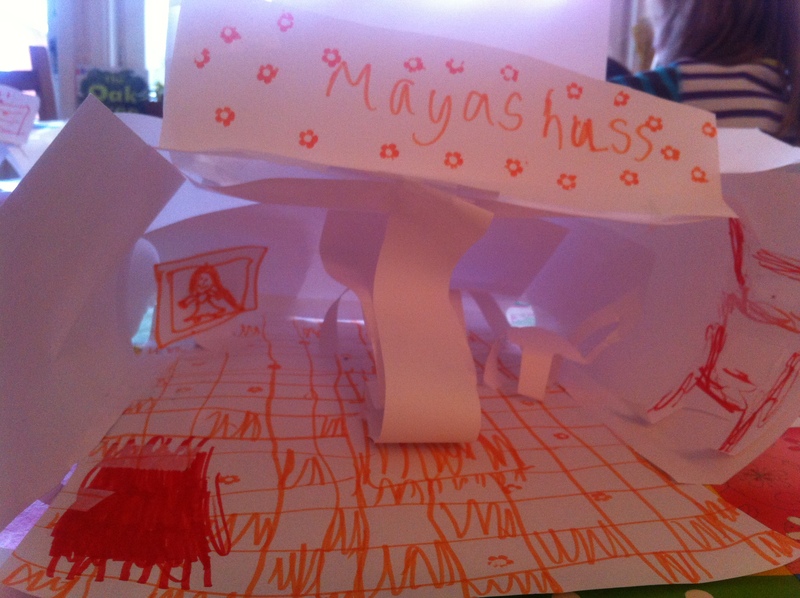 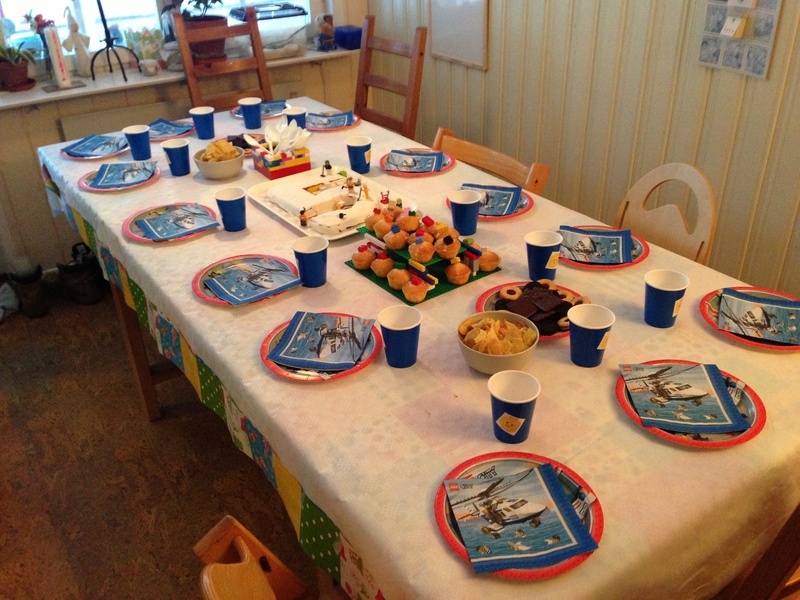 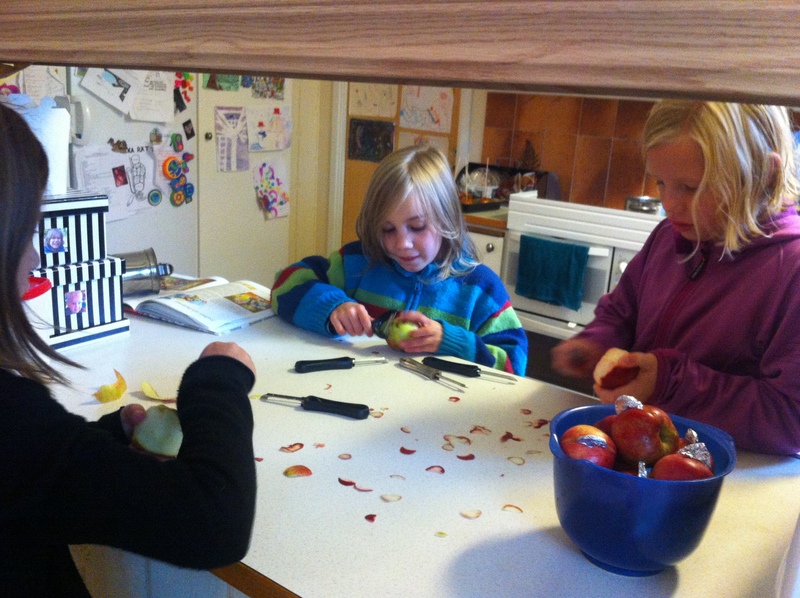 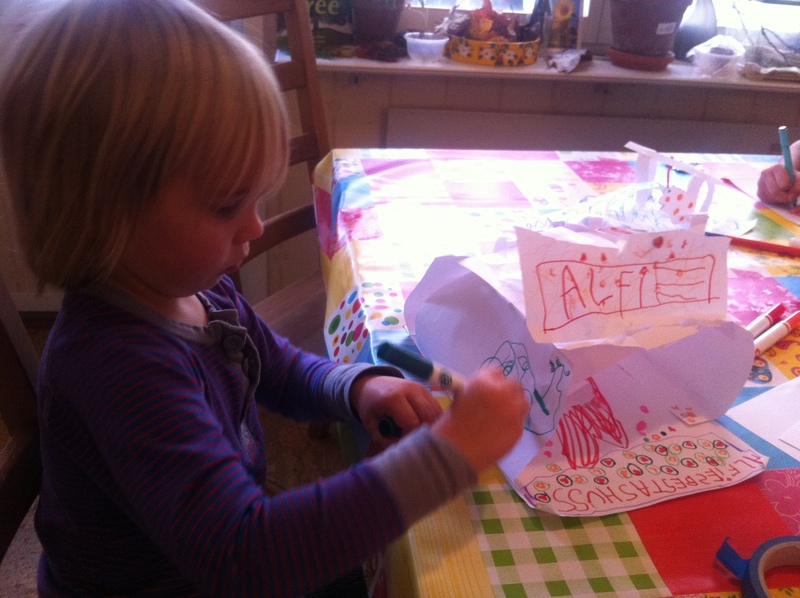 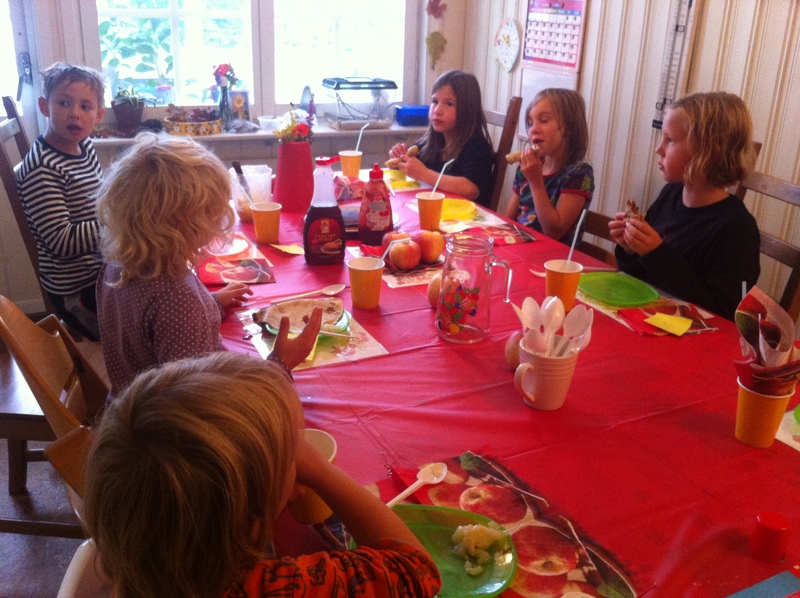 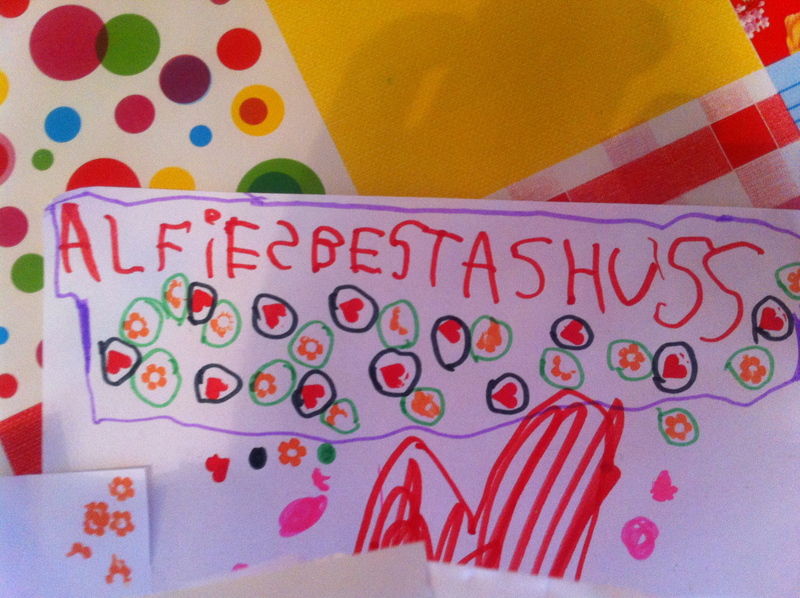 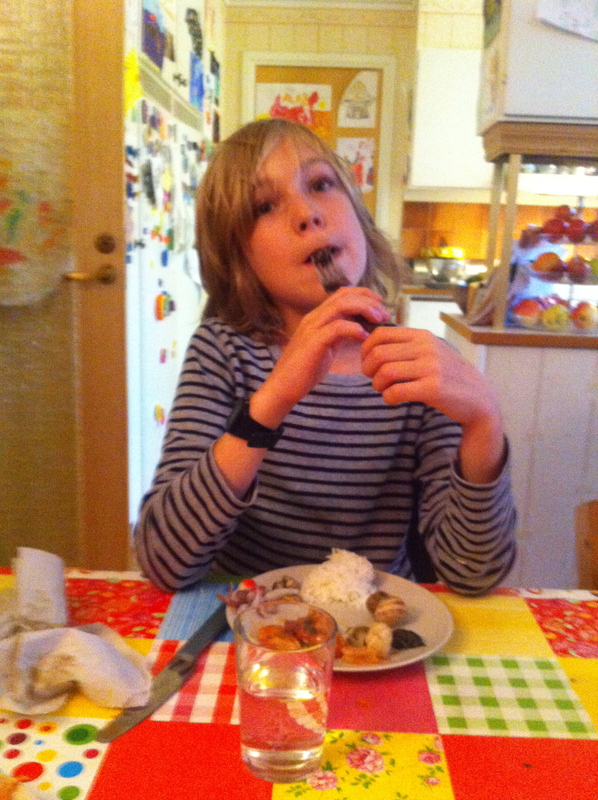 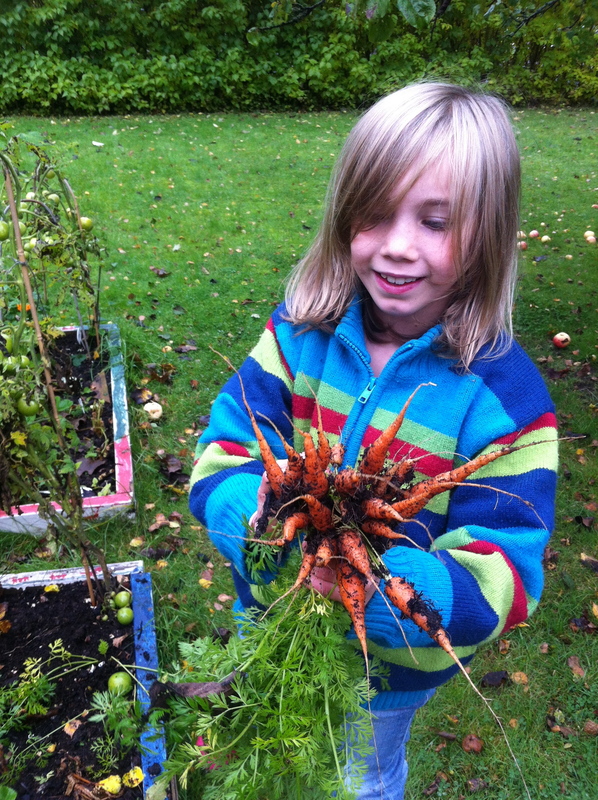 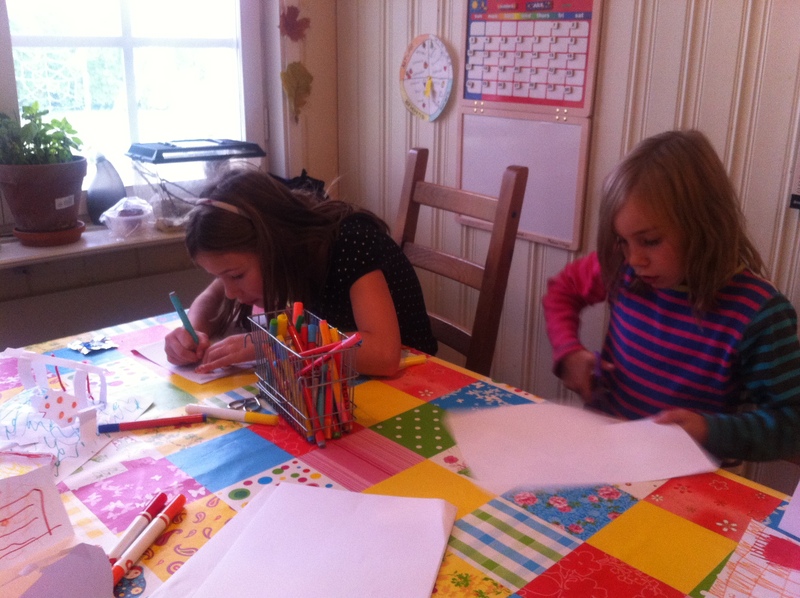 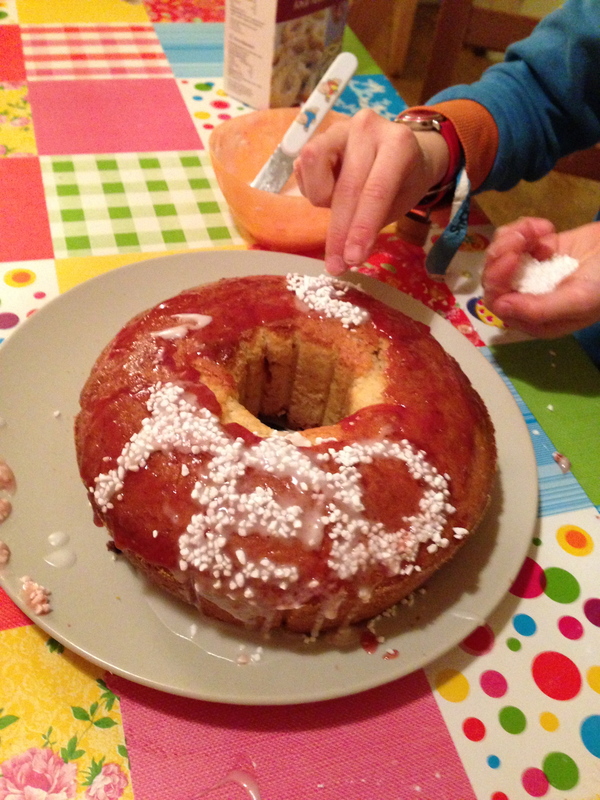 … hosting an apple party, organised by Maya and her friend Hanna…. 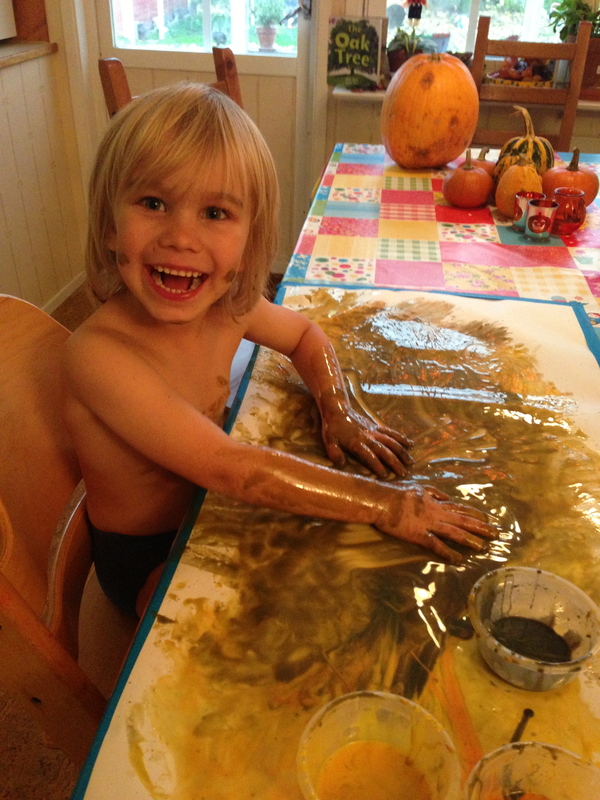 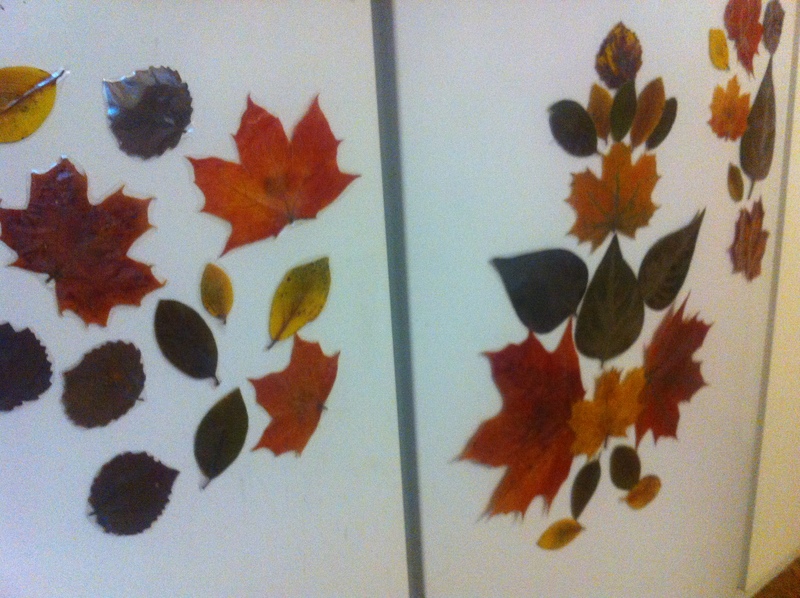 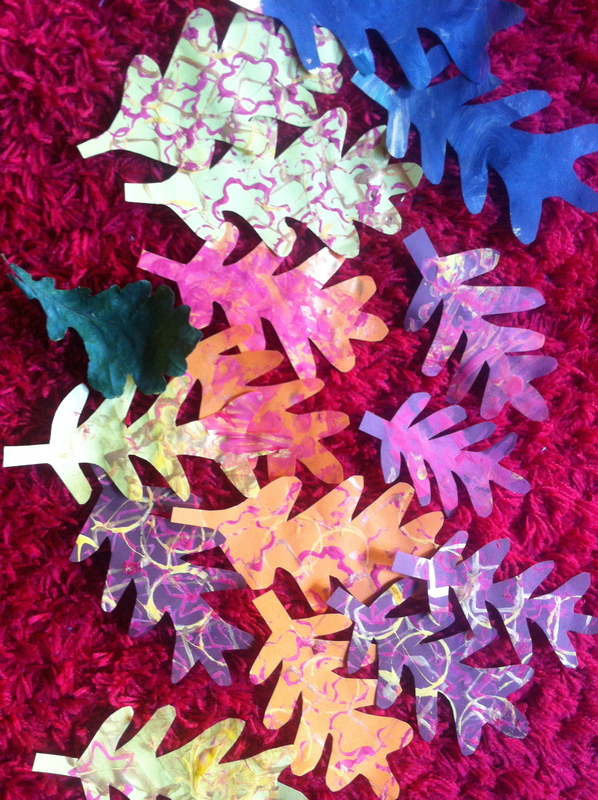 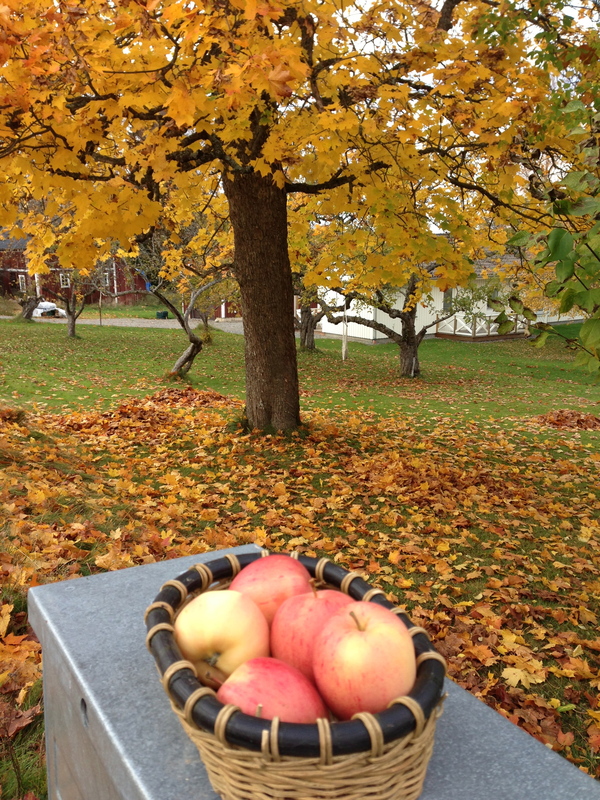 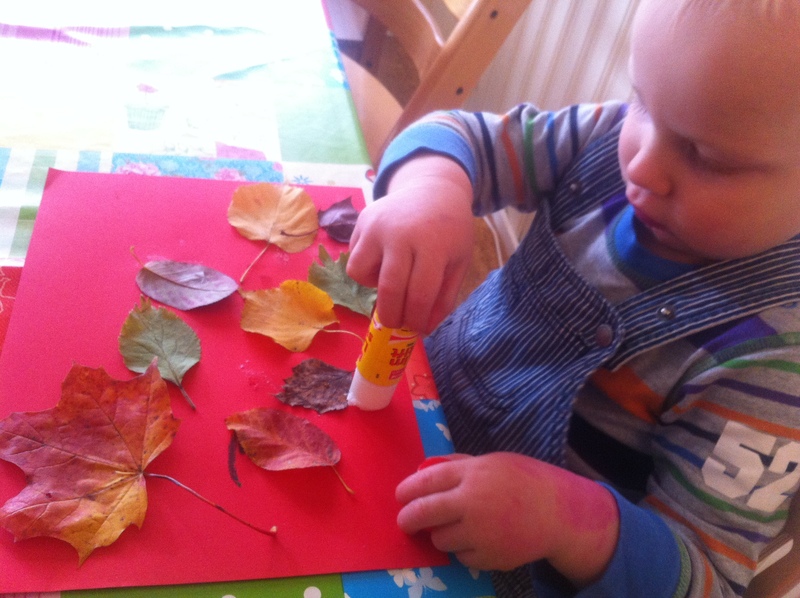 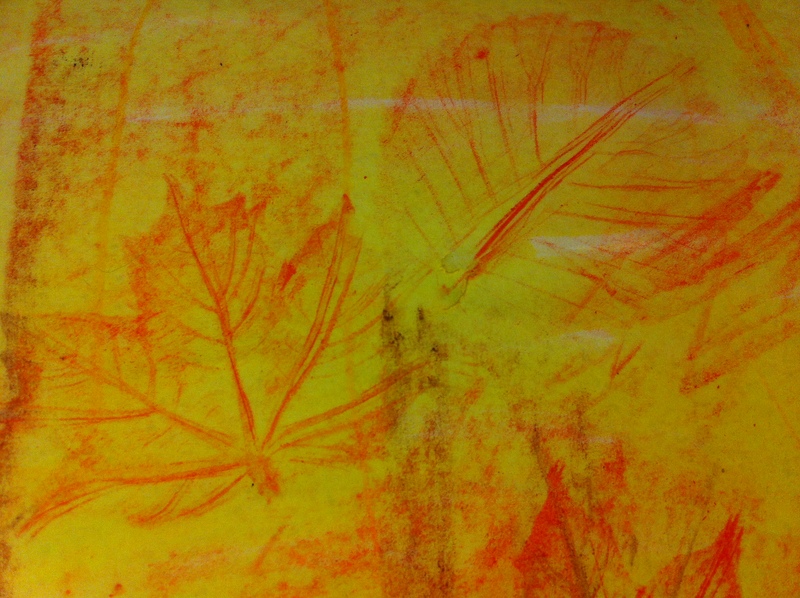 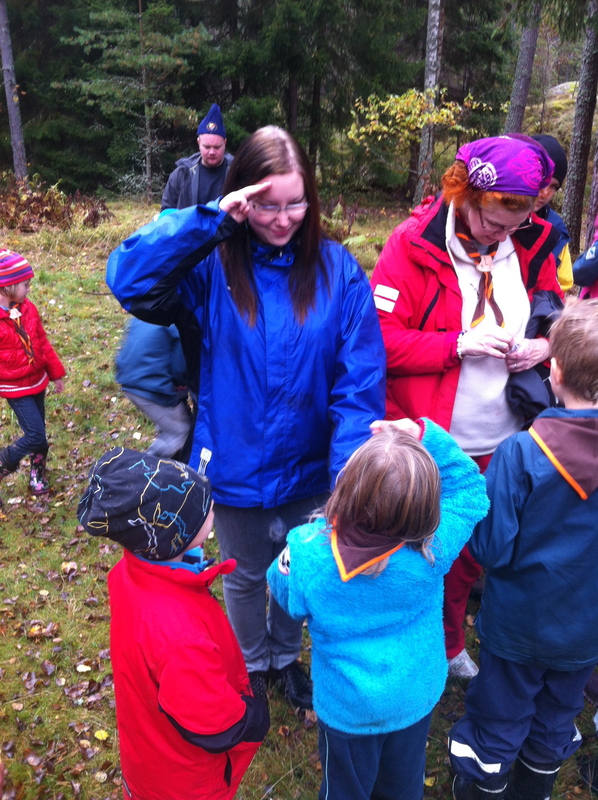 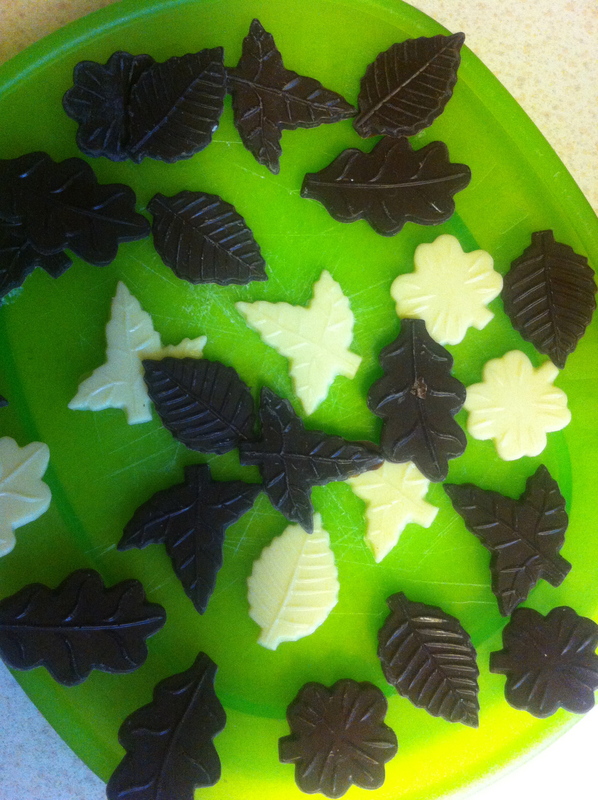 In October we enjoyed leaves…. 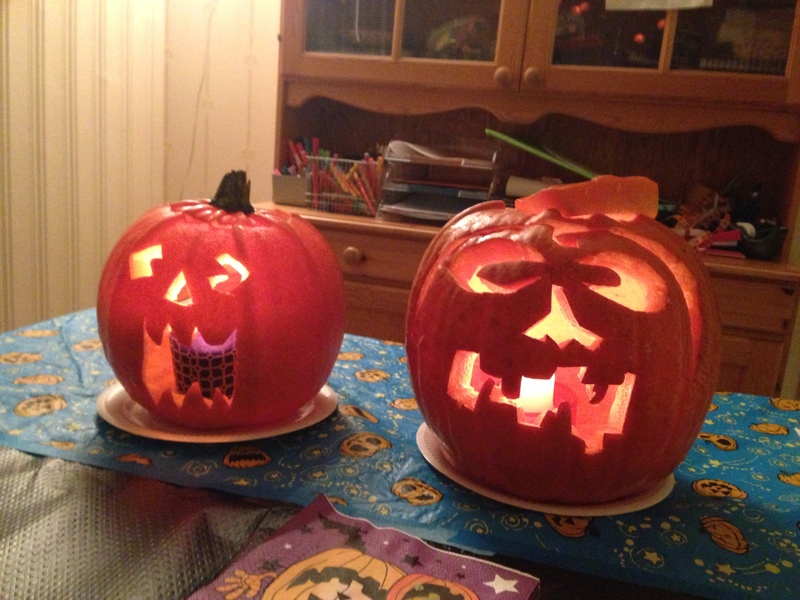 In October we also enjoyed pumpkins. 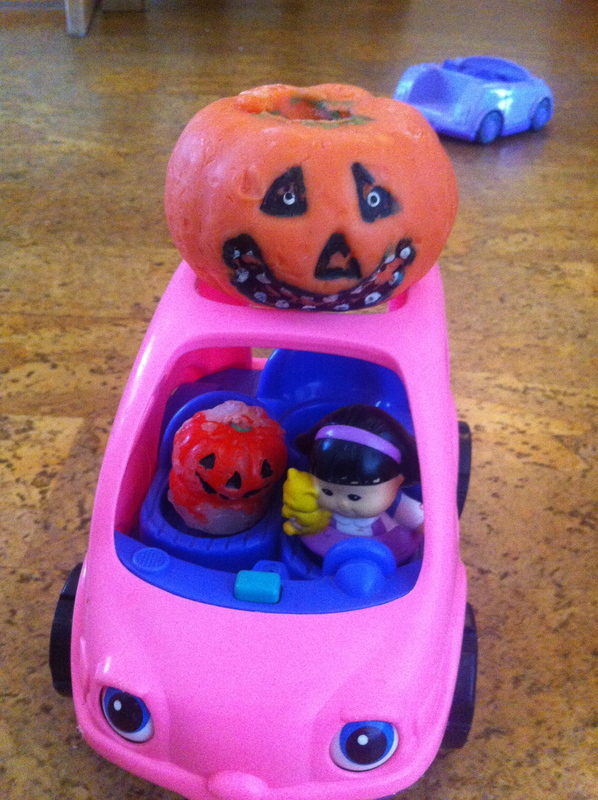 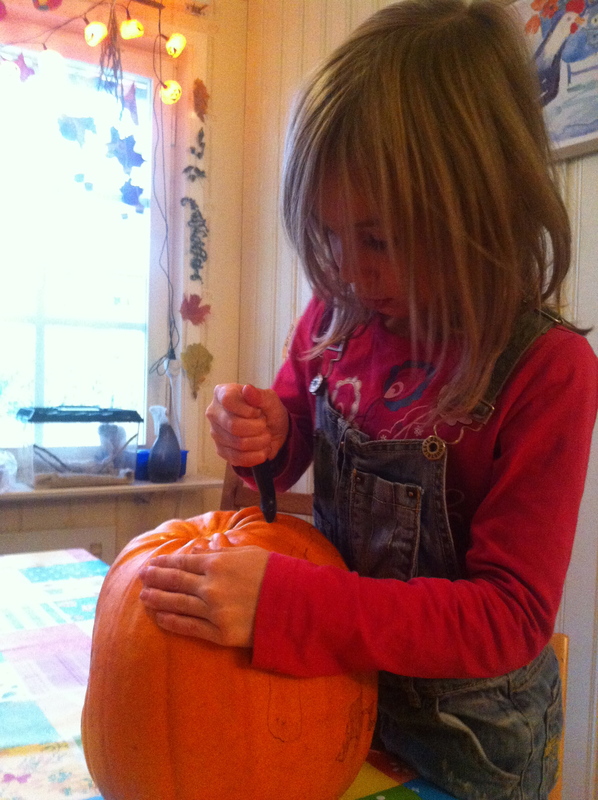 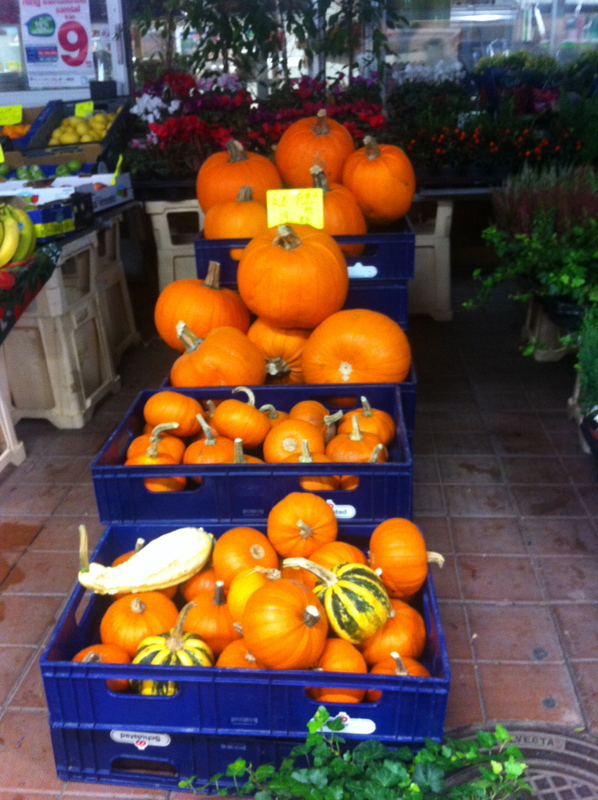 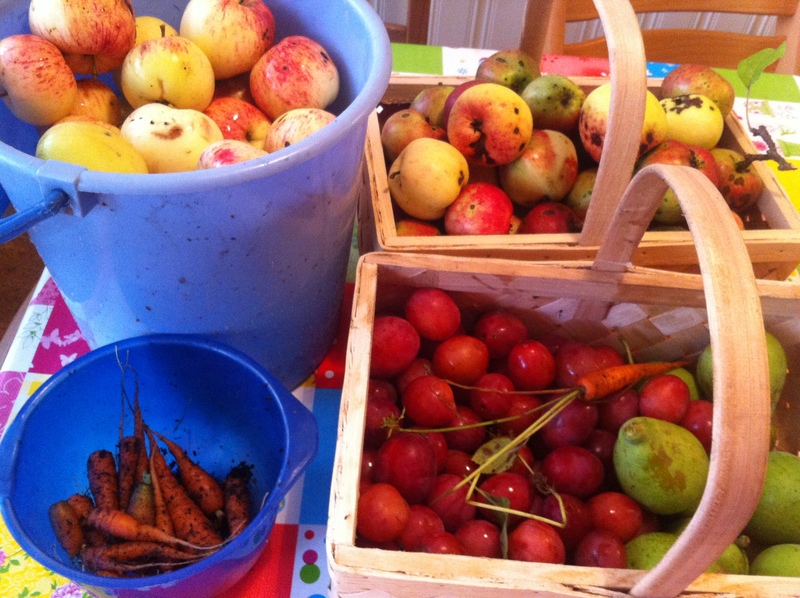 Lots and lots of pumpkins…. 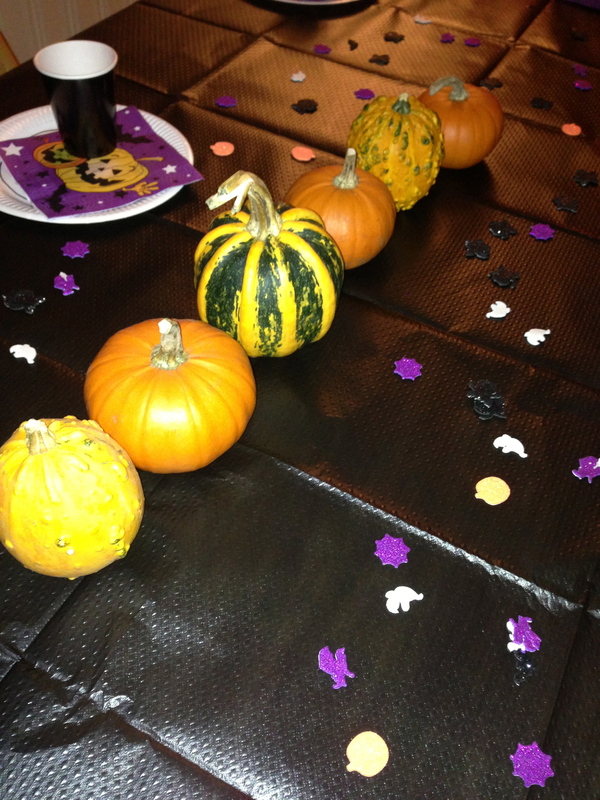 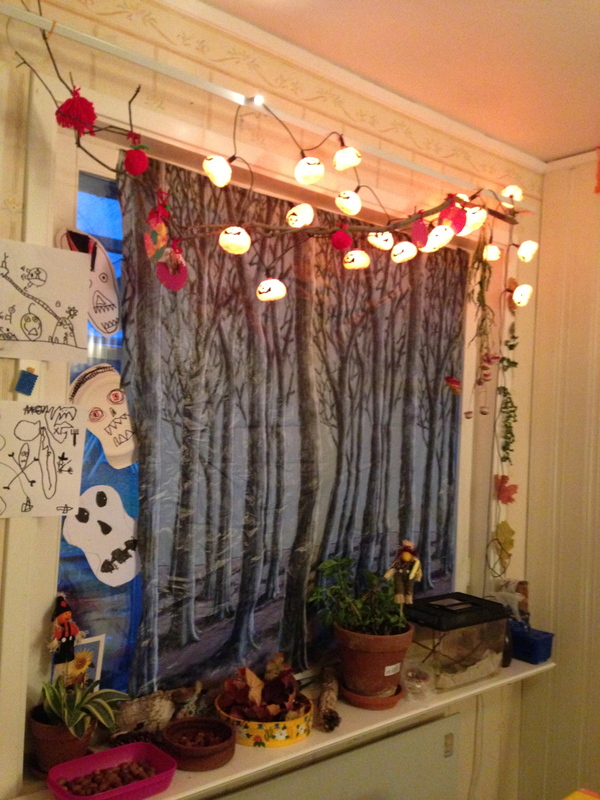 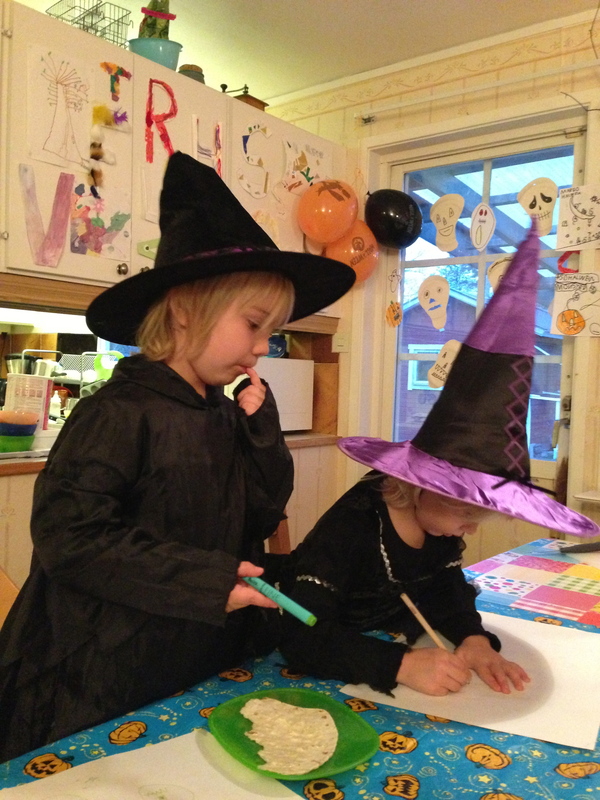 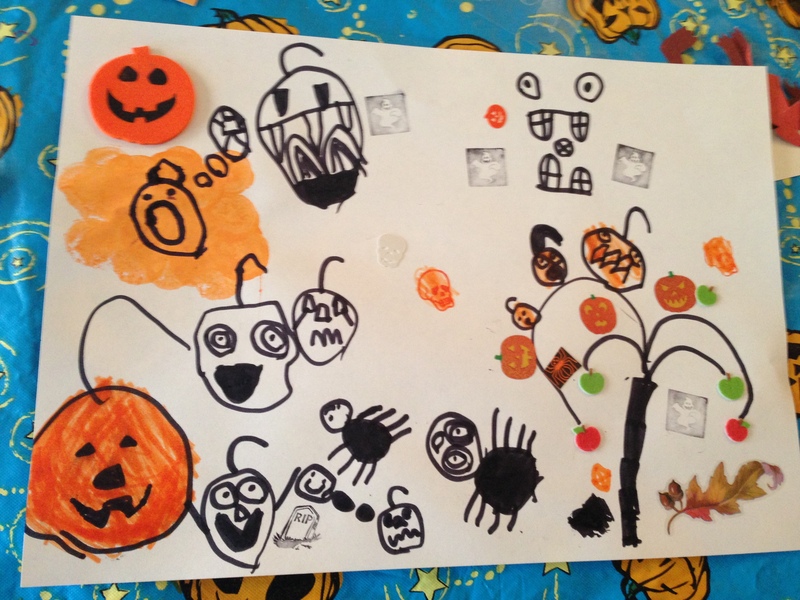 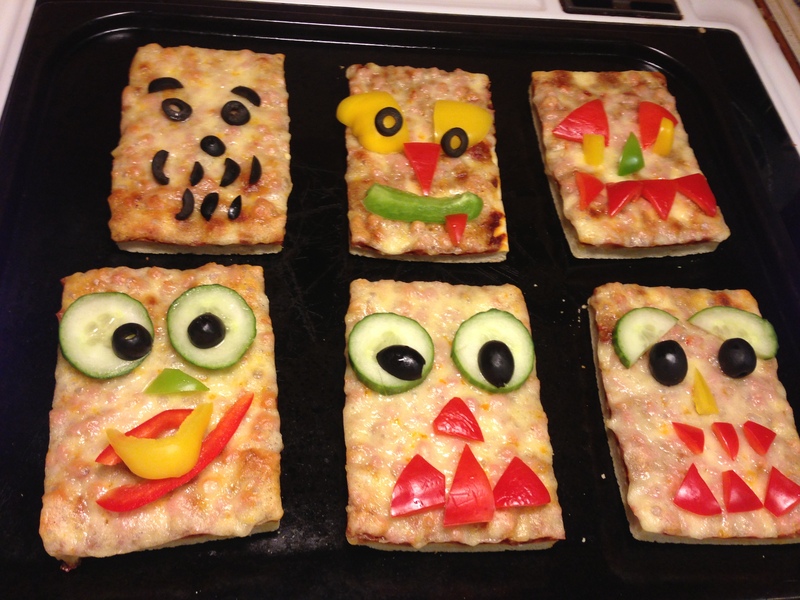 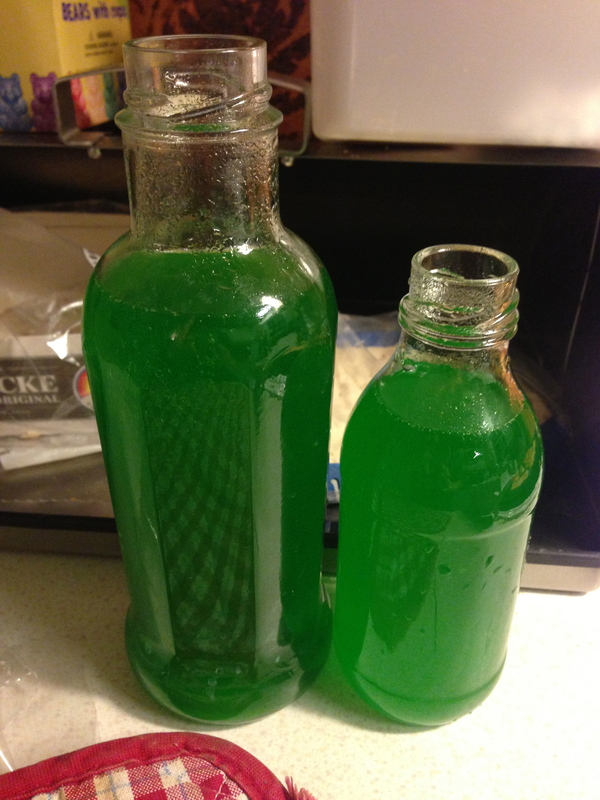 …and a Halloween party to boot…. 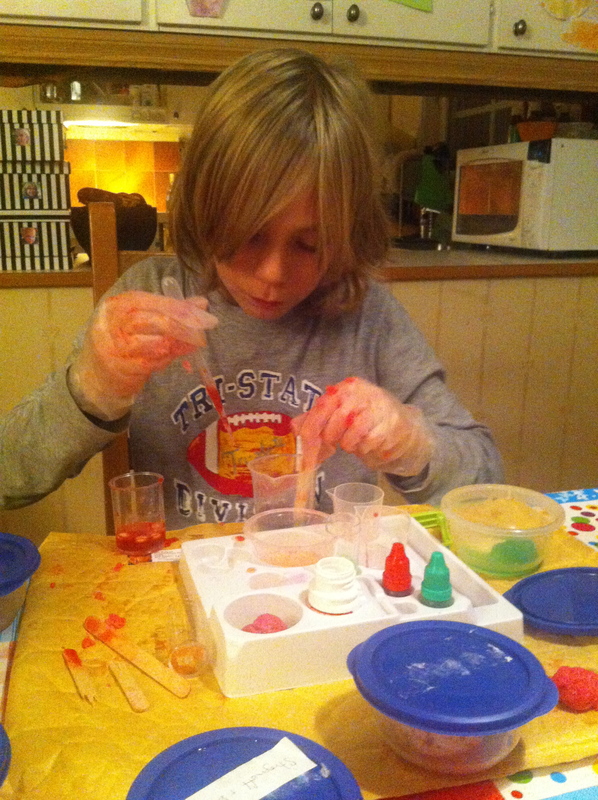 And our newly acclaimed scientist became….well….a scientist…. 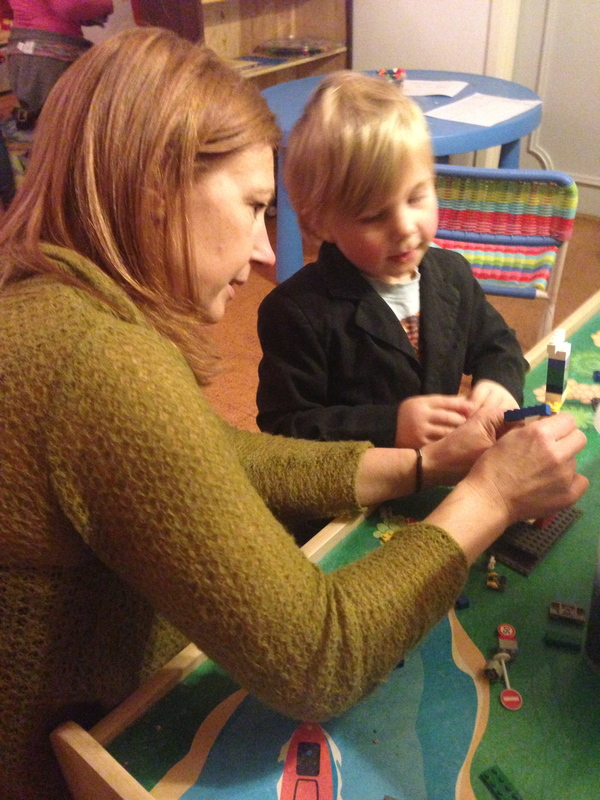 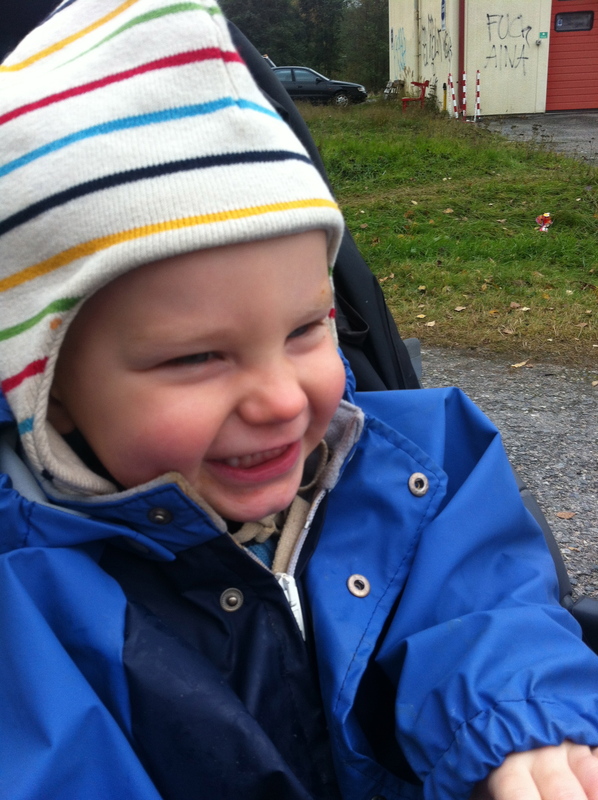 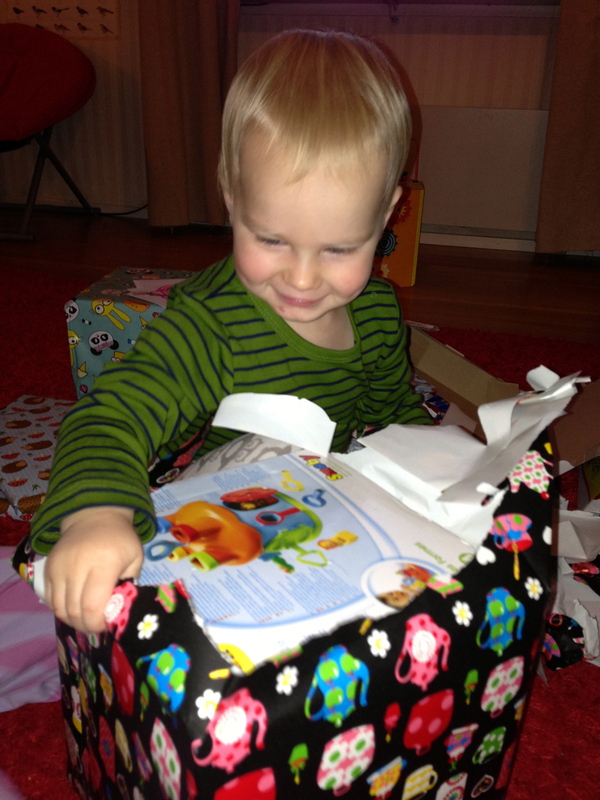 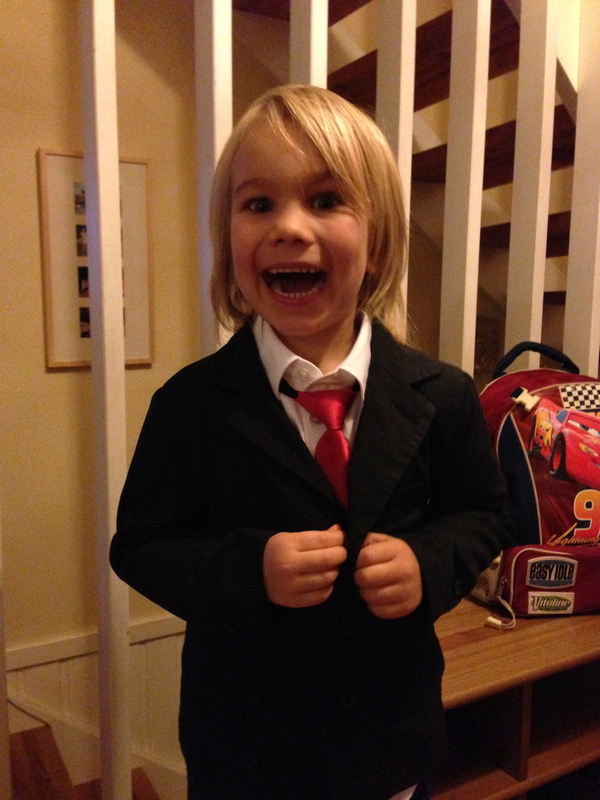 Plus a little person turned two…. 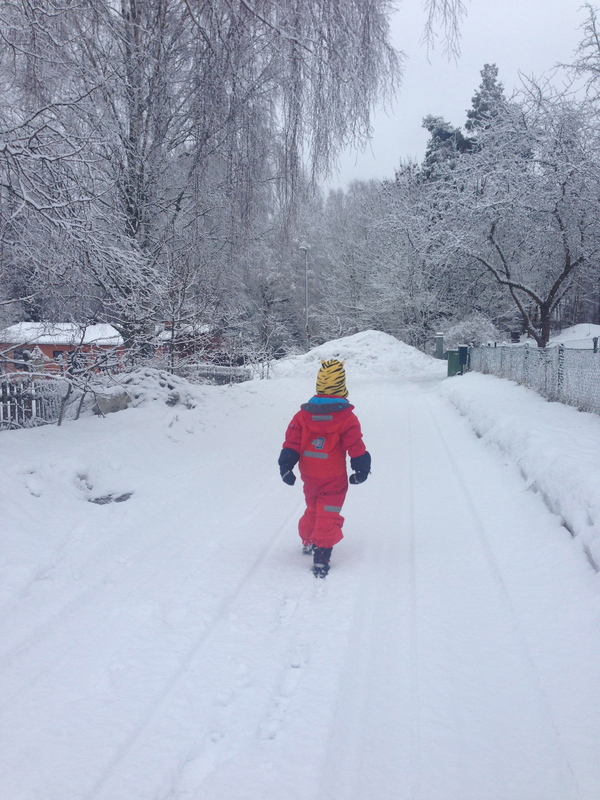 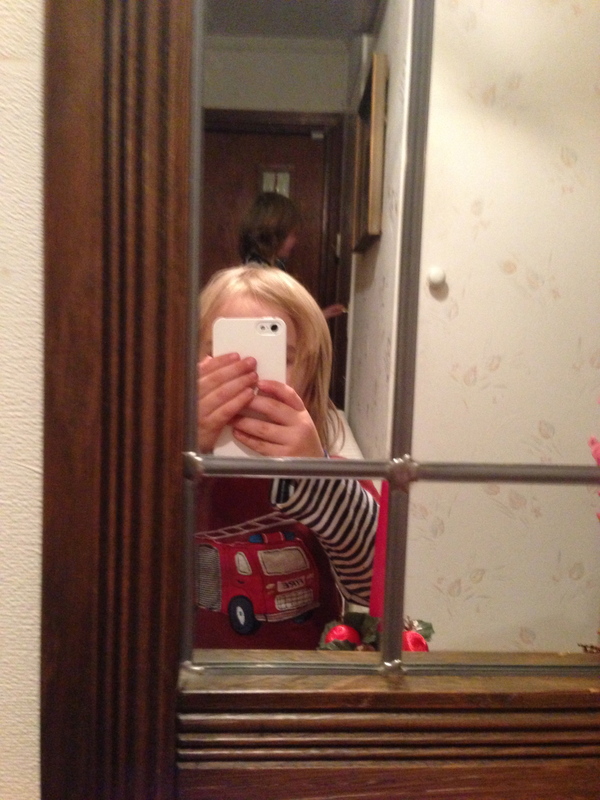 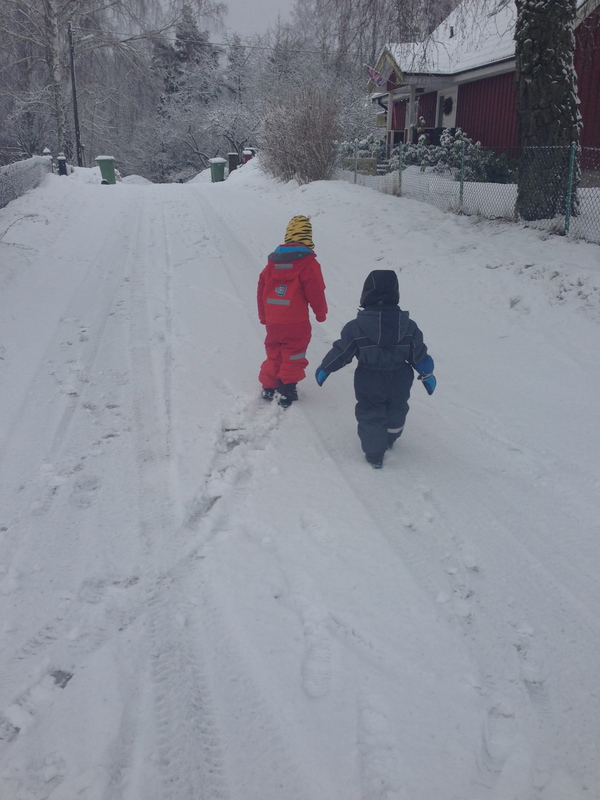 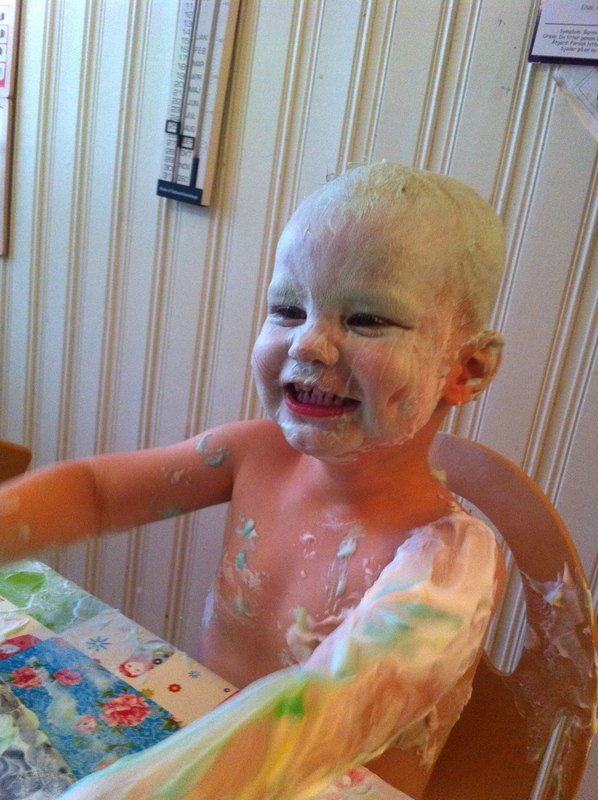 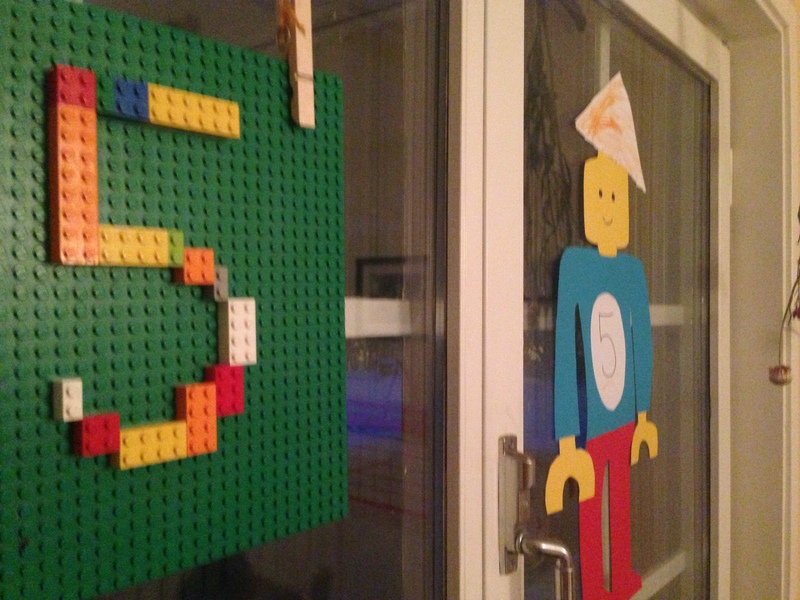 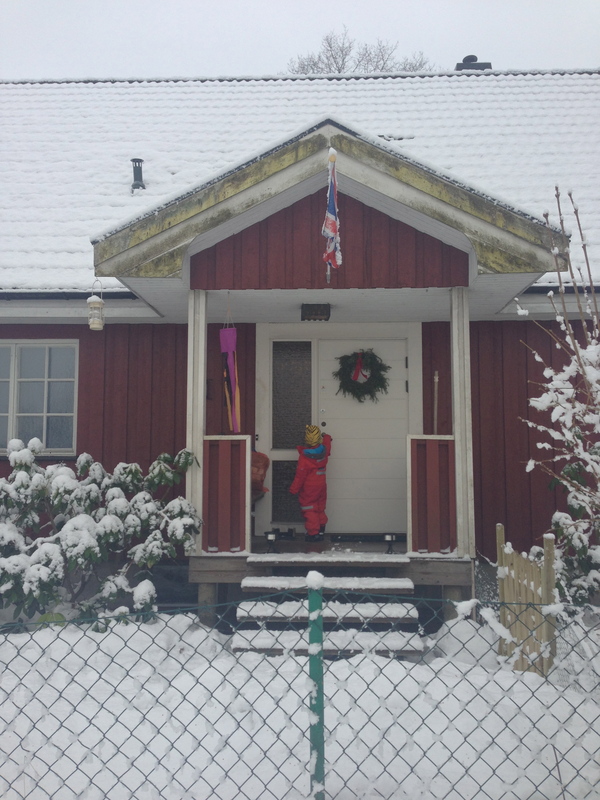 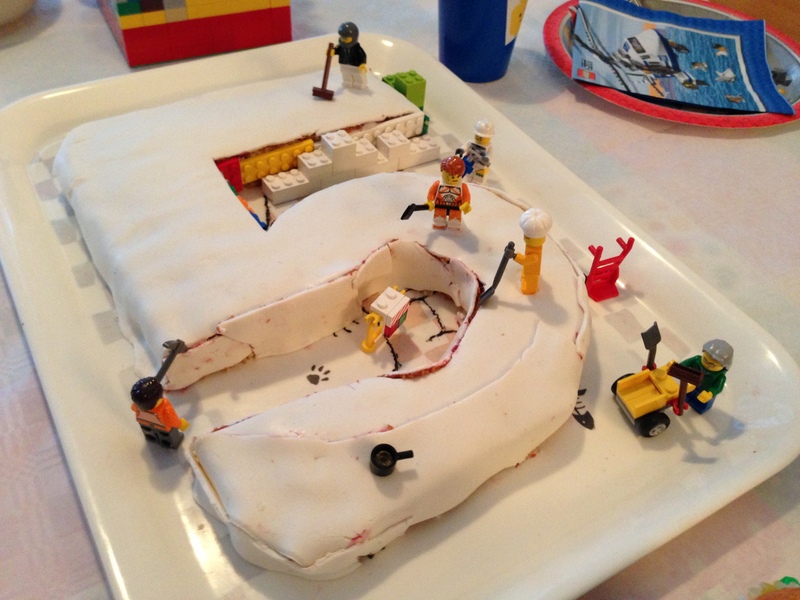 In December, another little person had a birthday, turning five..
And excited to have our first snow…. 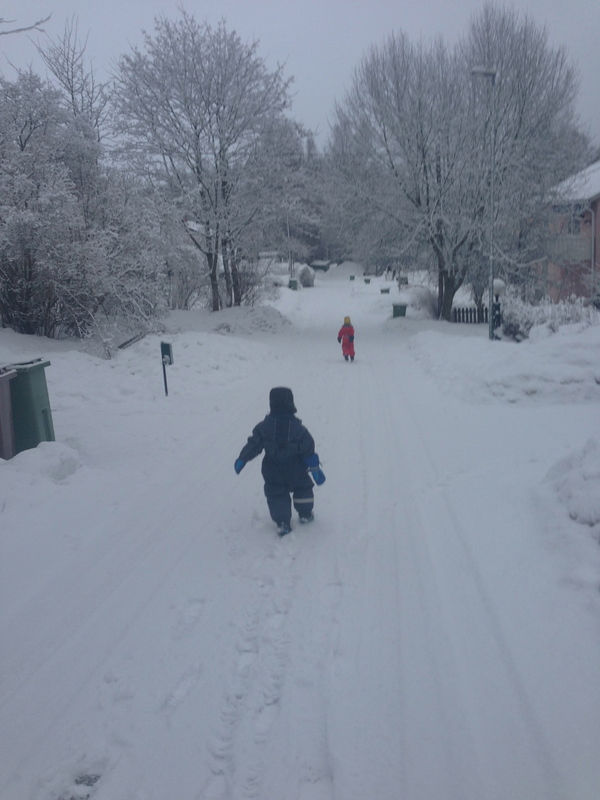 ..and then a full blown snow storm…! 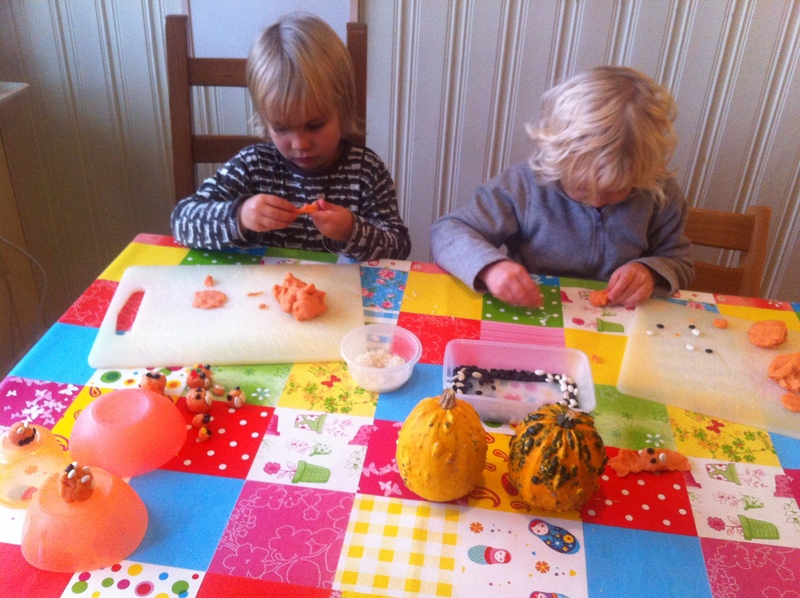 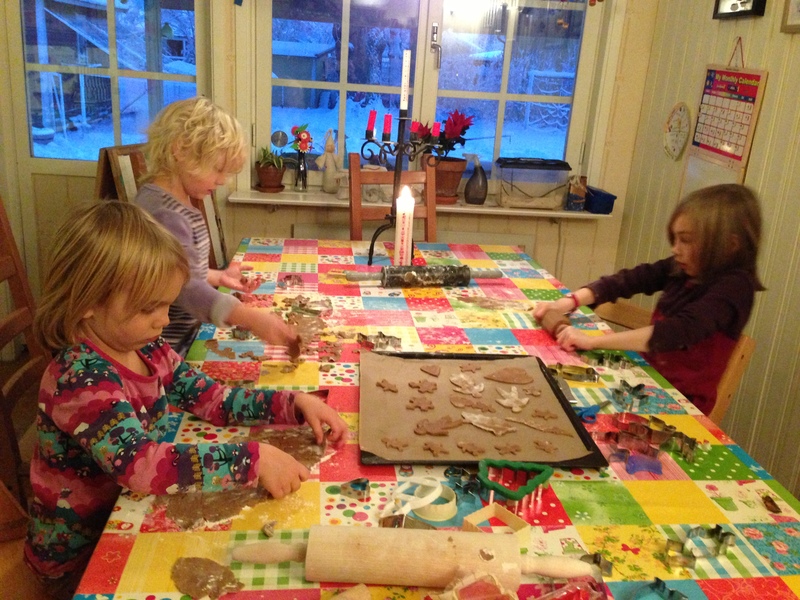 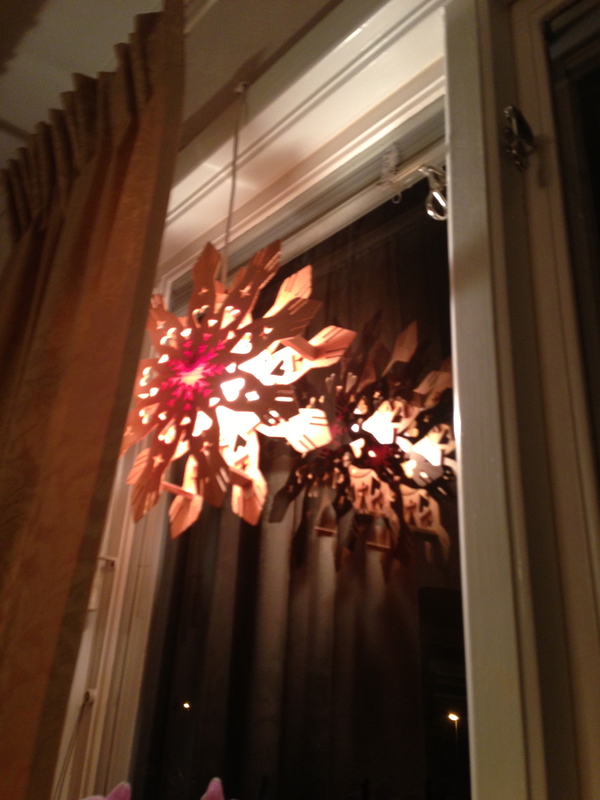 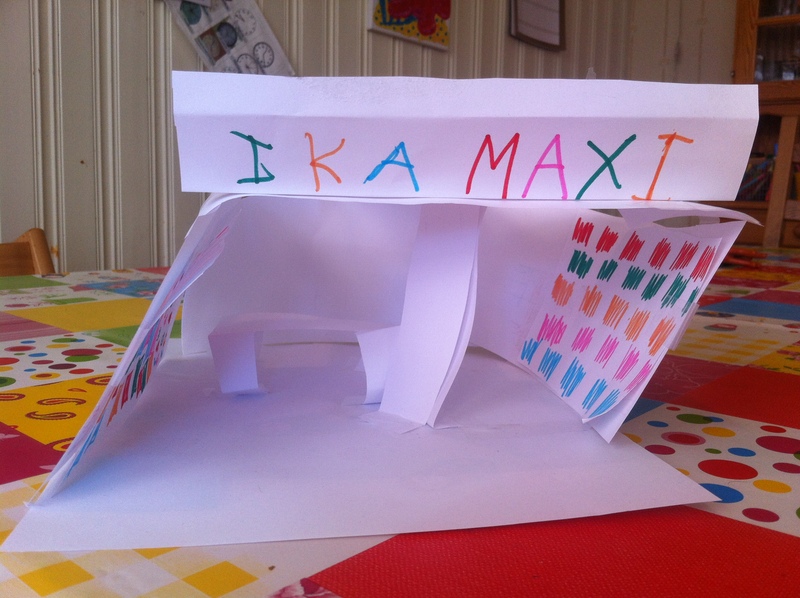 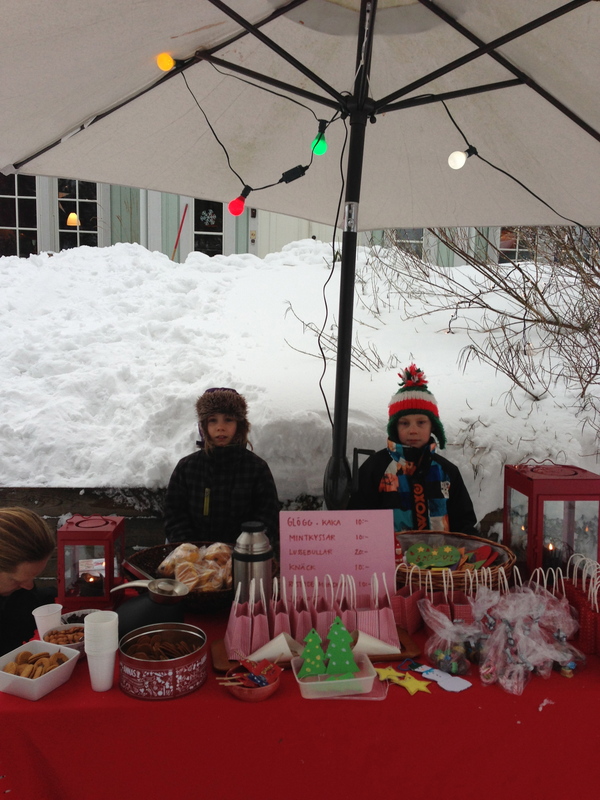 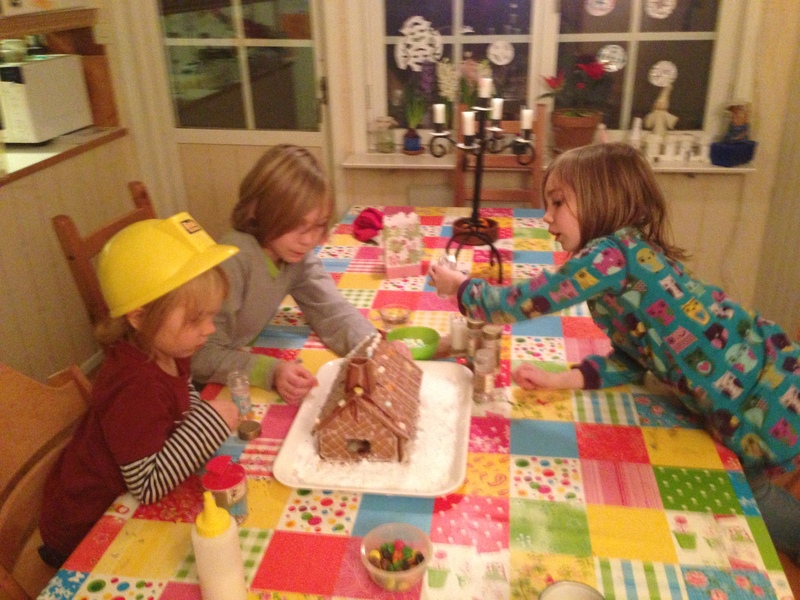 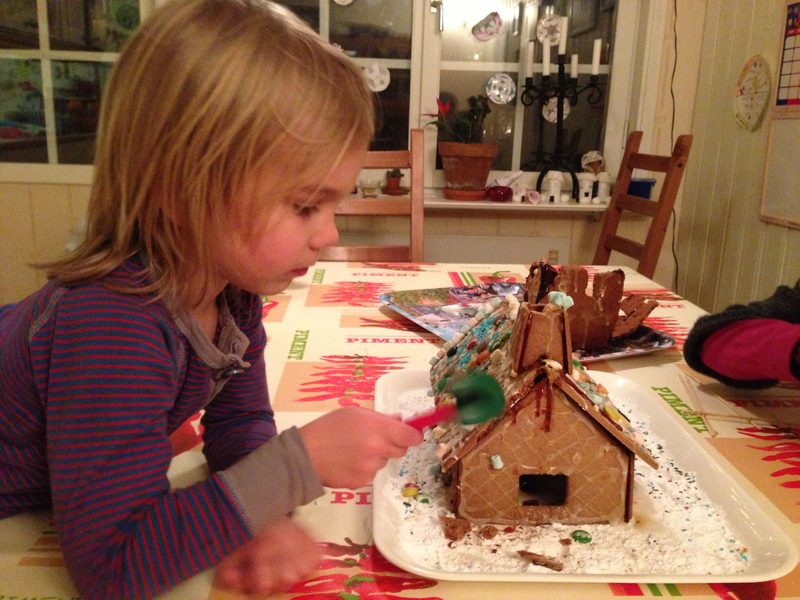 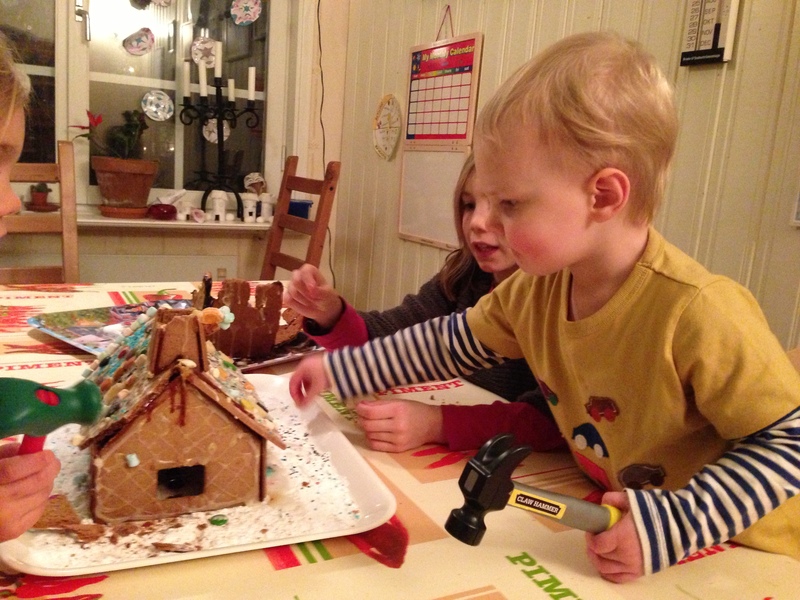 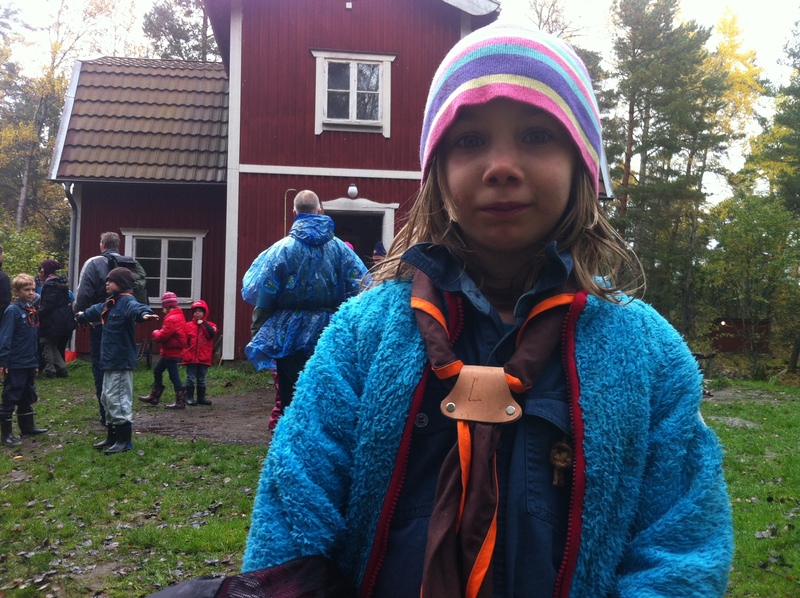 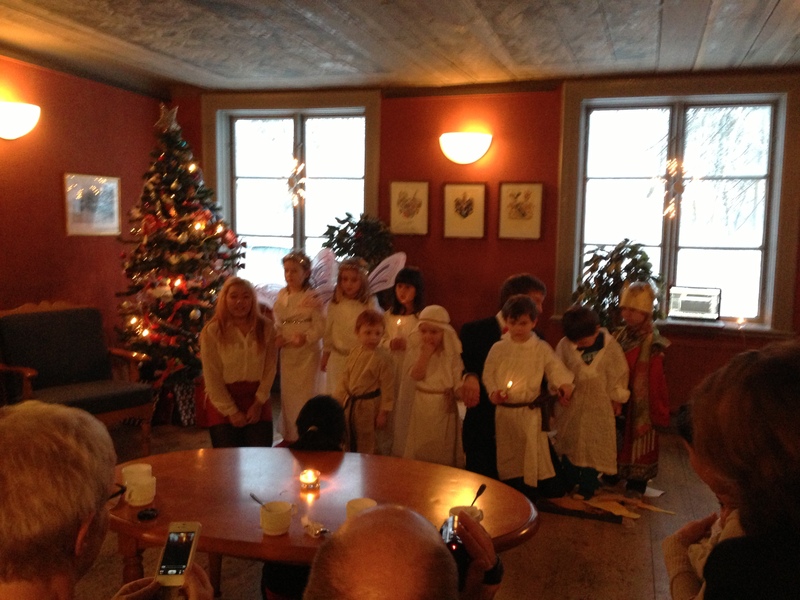 ..and this year, Maya and her friend Ludvig set up their own Christmas market..! 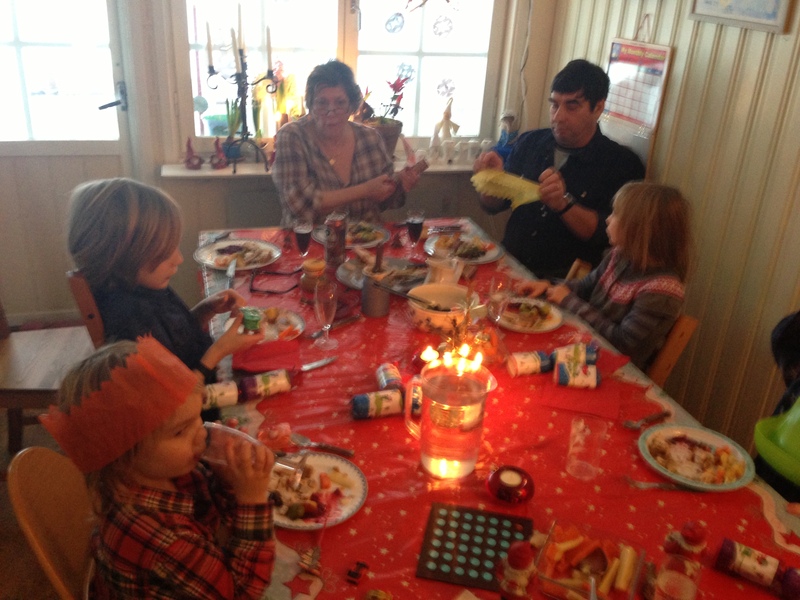 This year was doubly good because we had Mormor and Patu here from England! 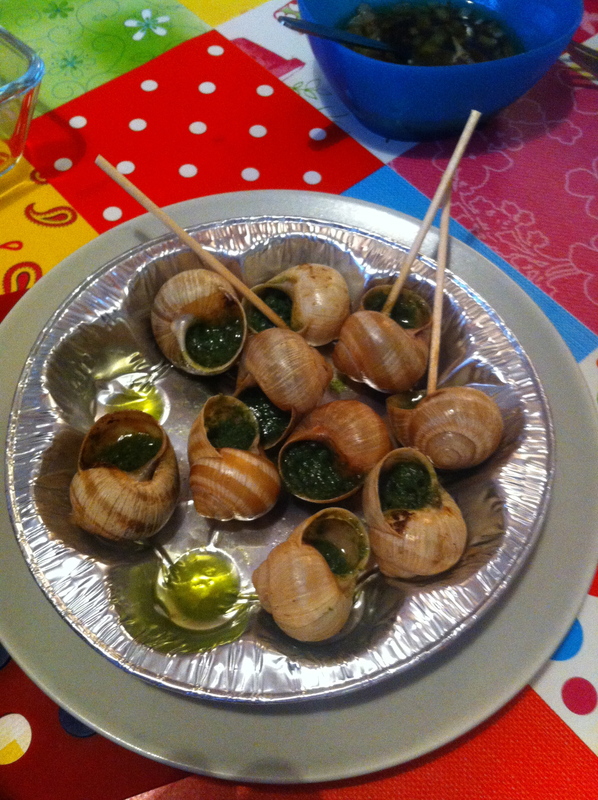 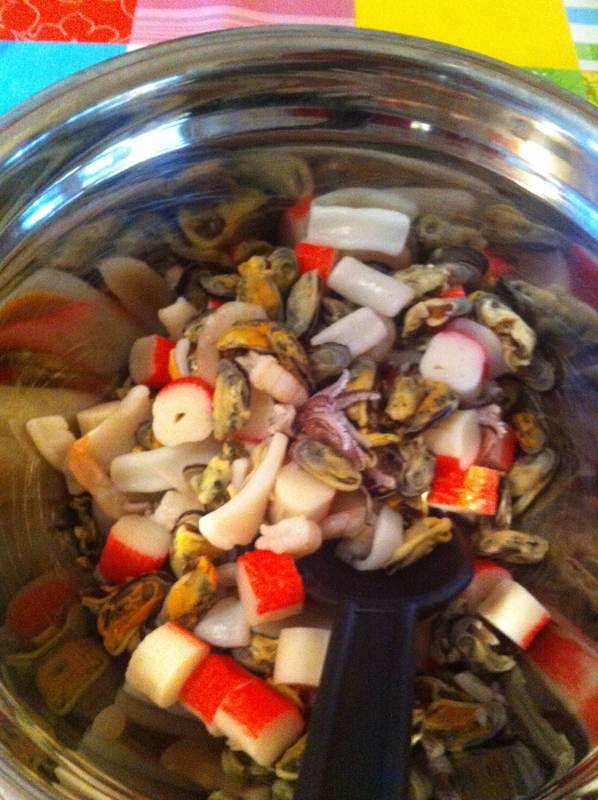 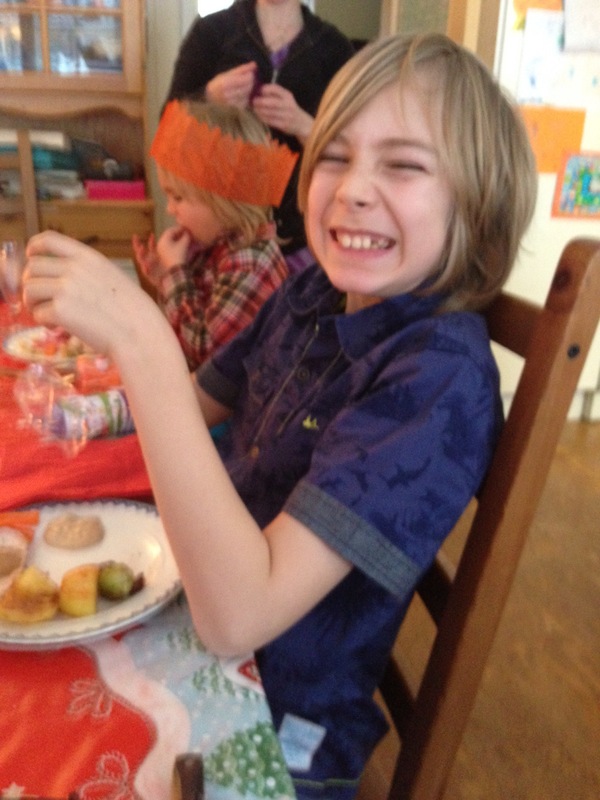 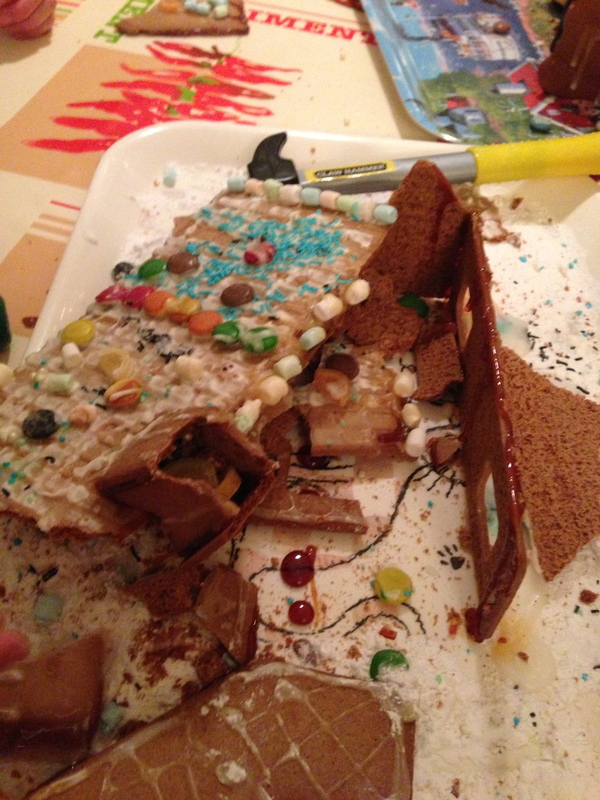 And thus enjoyed an English Christmas dinner…. 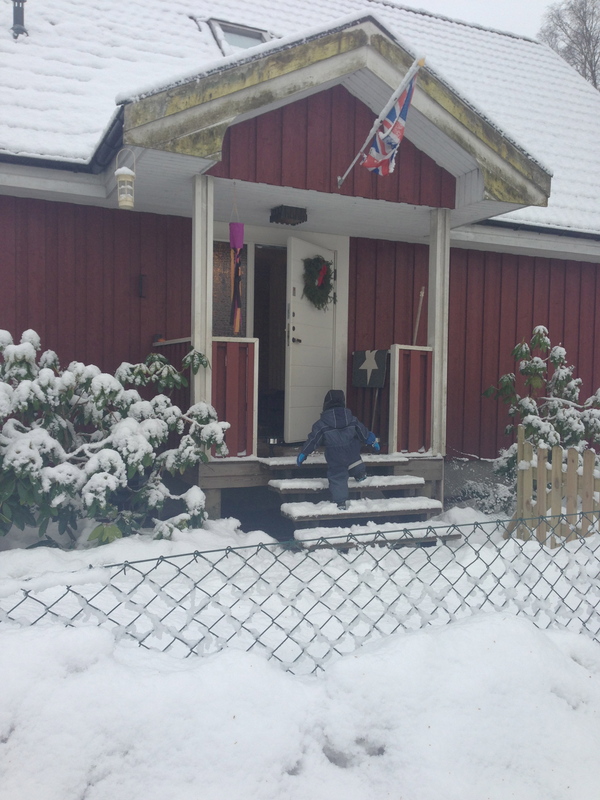 And so our last days of this year were spent enjoying our grandparents before they went back to England, ringing in the New Year with our neighborhood friends, playing many board games, and dare I say it, nursing colds, coughs and sneezes!